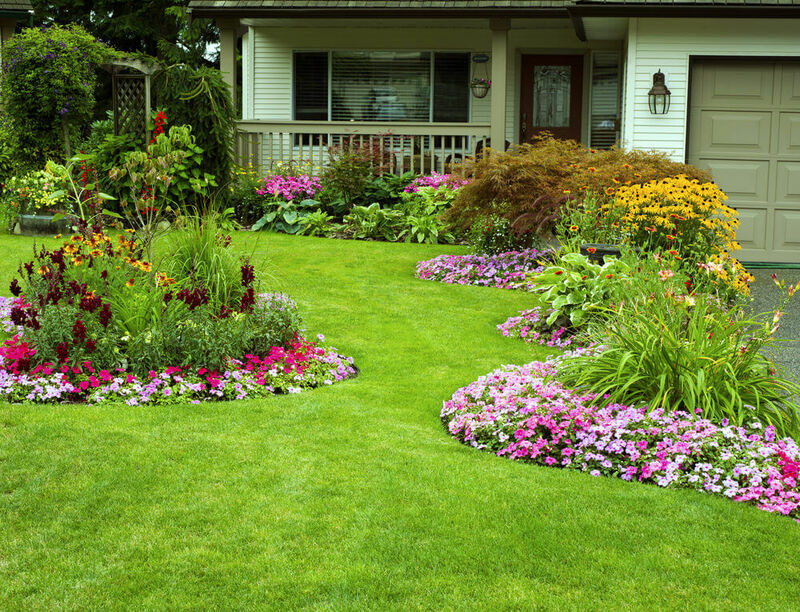 While the backyard is for you, the front yard is often made beautiful for neighbors and the public generally. 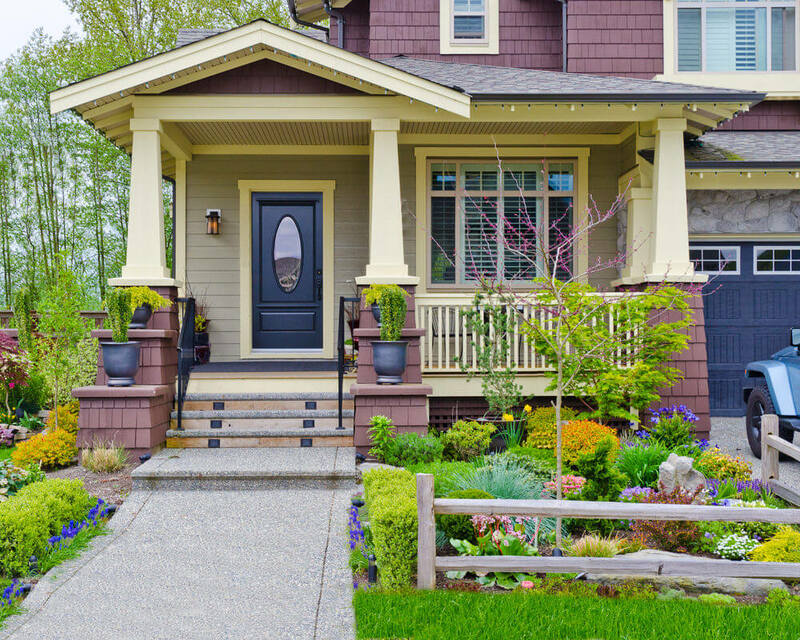 Gardeners have a real advantage when it comes to making a welcoming home because at least 50% of a home’s curb appeal is the front yard gardens. No 2 gardens are alike. 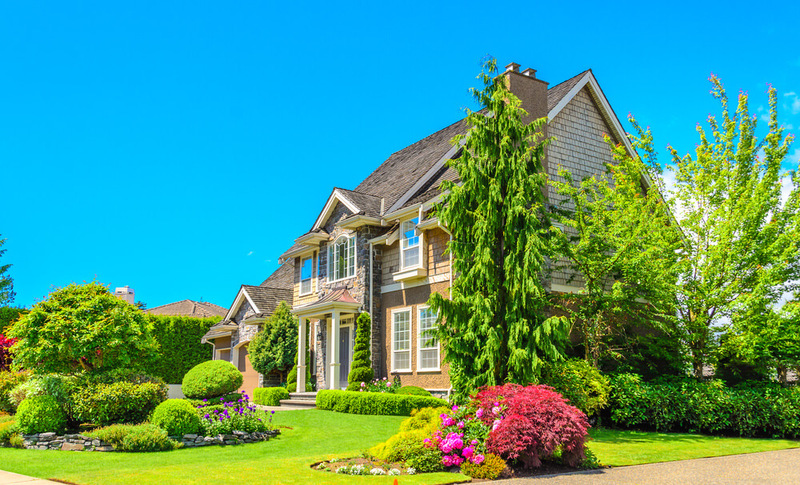 Your front yard is your canvas. 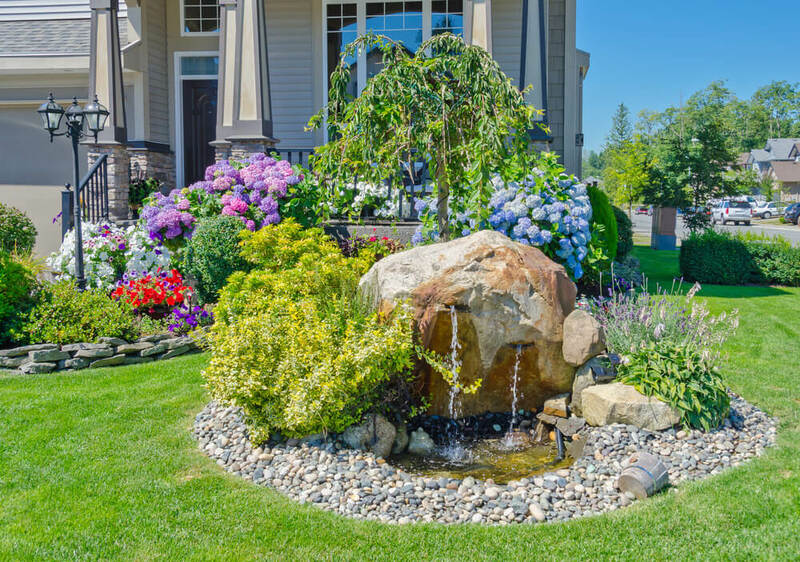 Featuring the vast greenery and colorful blooms of geraniums, decorated with rocks around them, and a fountain showering on a corner highlights the view. 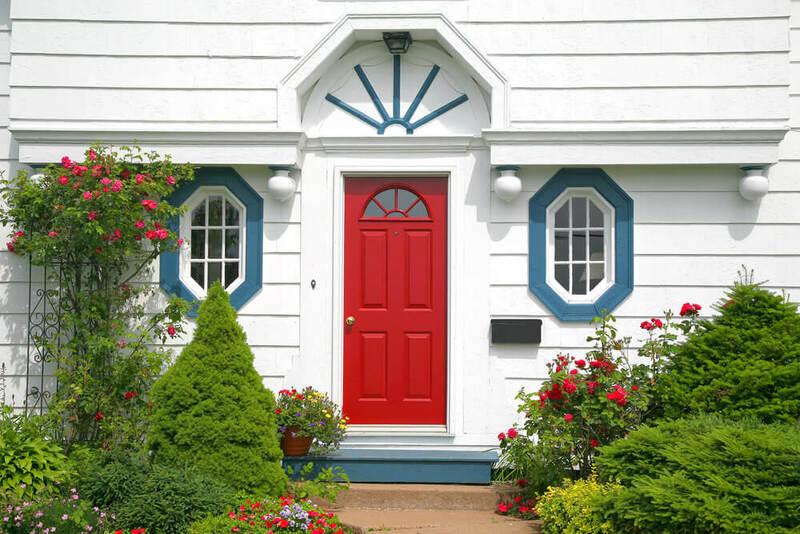 Green ornaments pruned into round and square shapes attract attention. 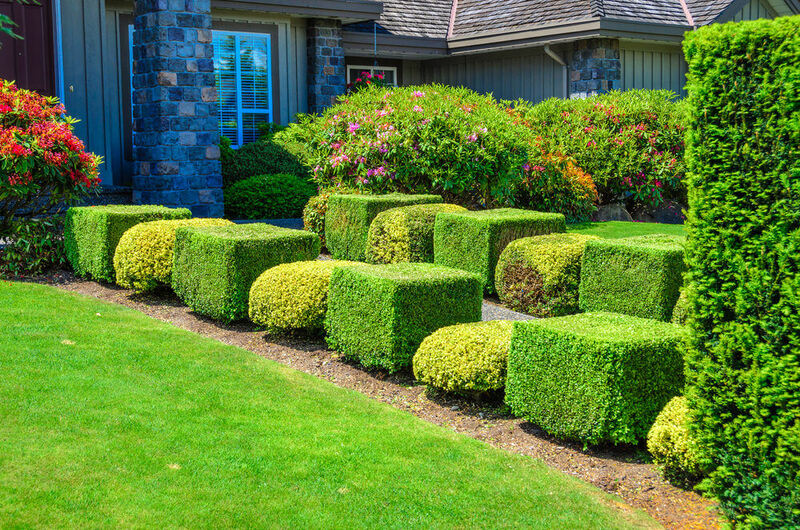 These are called topiary. 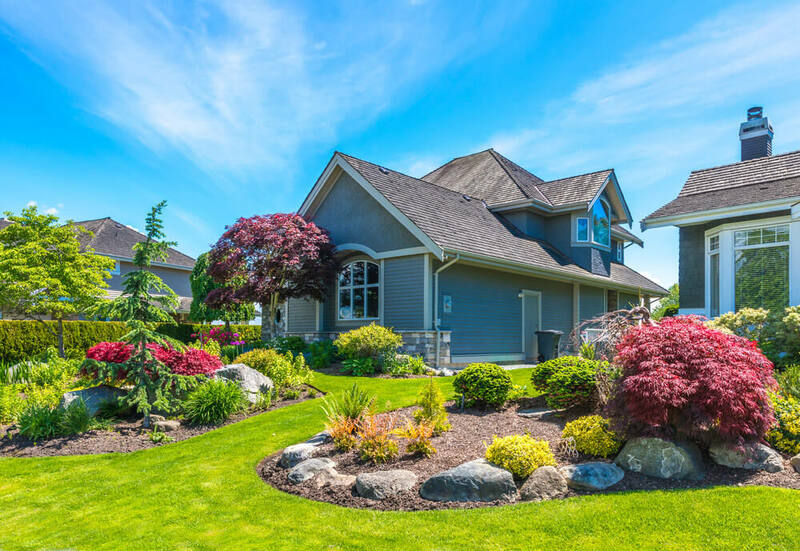 Green grasses ornamented with colorful blossoms of petunias, sword foliage and other non-flowering plants make the view pleasing to the eye. 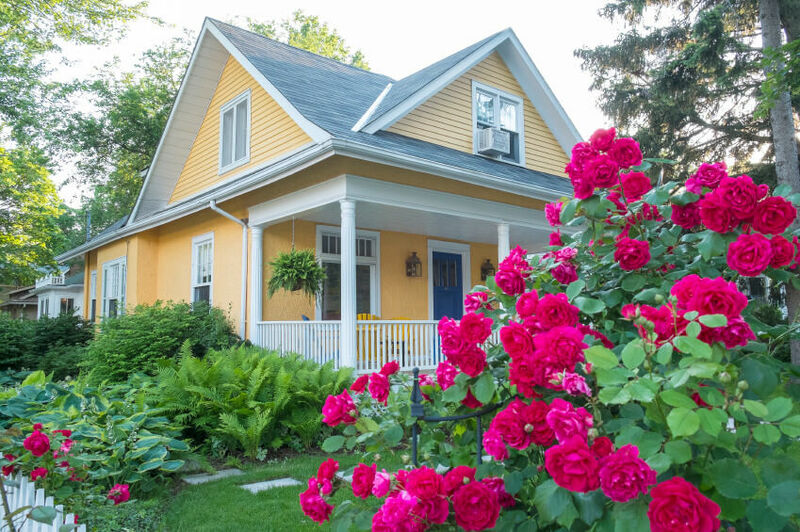 The full-bloomed roses almost take the whole view of the front yard. Inside is a walking path installed in between ferns and other green ornamental shrubs. 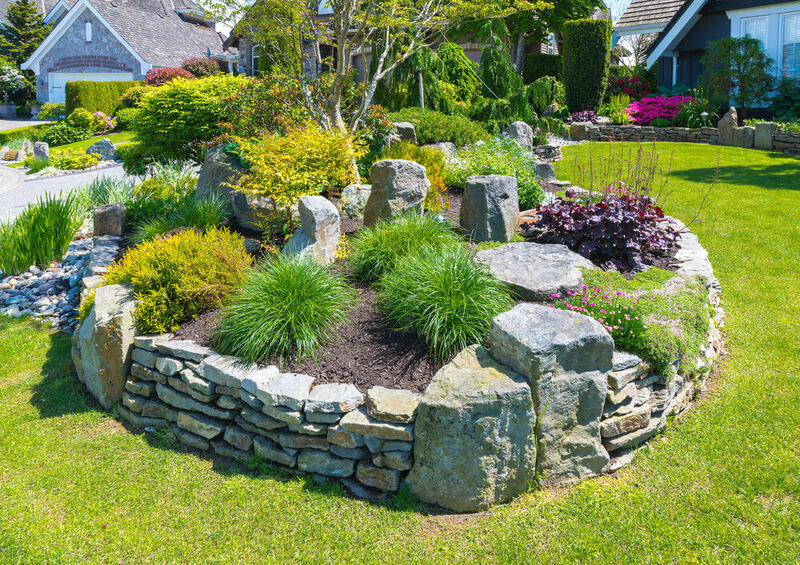 This mini garden is filled with striking green foliage landscaped with a few blossoms, large rocks and a wooden fence. 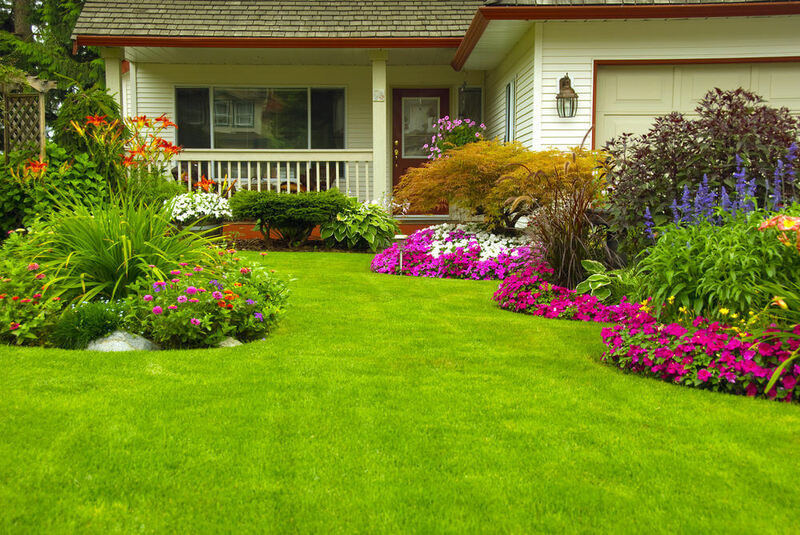 A landscape of class and style, where you find well-maintained grasses, trimmed plants and colorful blossoms. 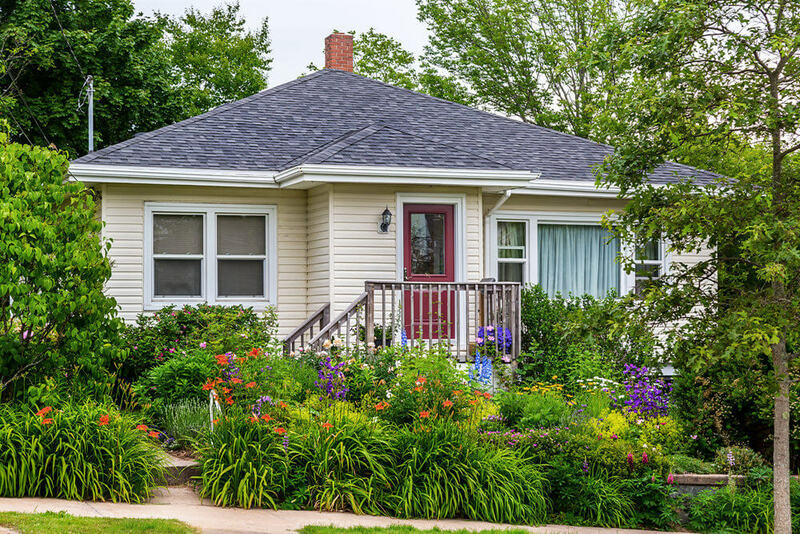 The garden of healthy grasses and shrubs house a welcoming woman figure resting behind the bush and colorful blooms of petunias. It is also decorated with a lampshade that lights the grassy path at night. 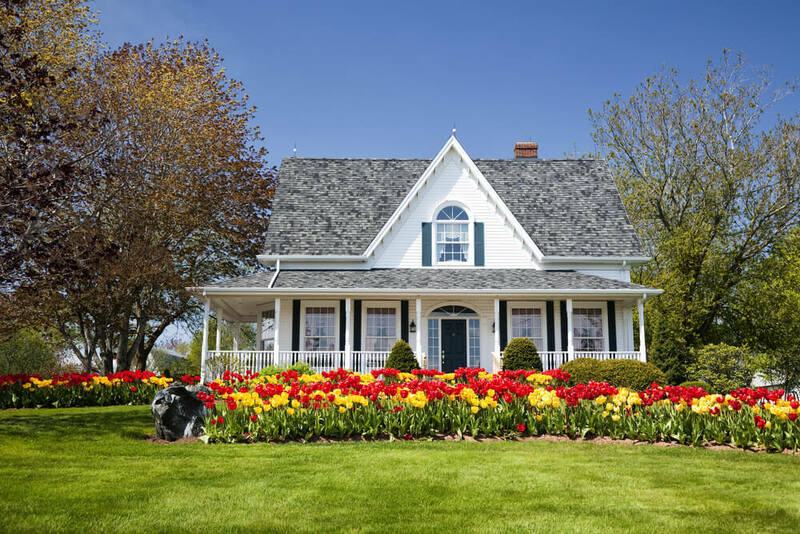 The elegance of this white house is given more emphasis as the stunning red and yellow color effect of tulip blossoms surround it. 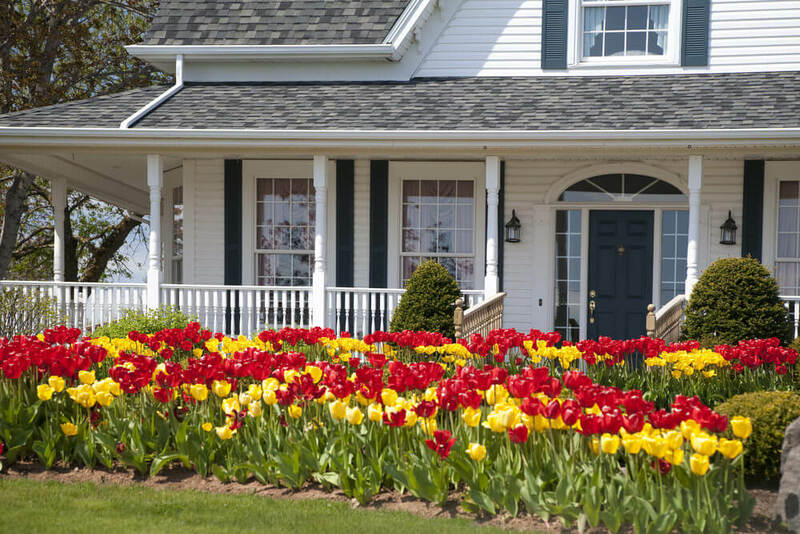 The greenery and simple view of the white house serves as the tulip’s perfect spot to shine. As always, white is a perfect background that highlights other colors, just like these green shrubs and colorful blooms. One word to describe this view yet it is striking. 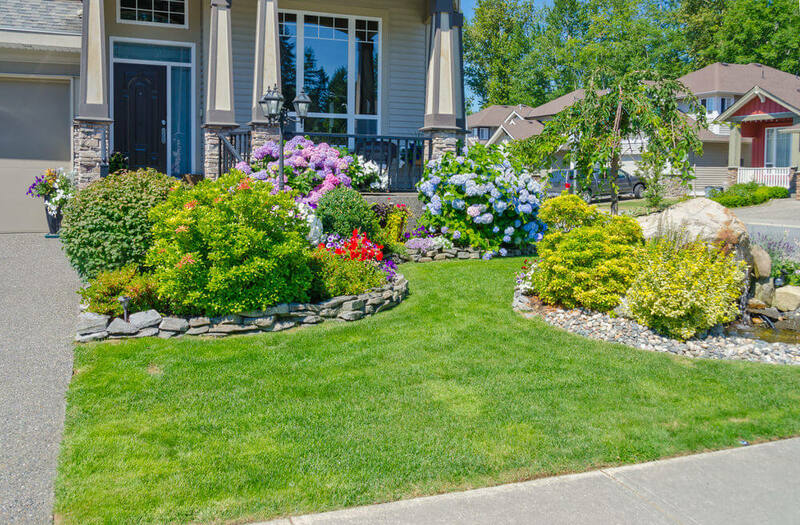 The path is decorated with plants uniformly trimmed into squares and Bermuda grass while two ornamental grasses stand proud on each sides. 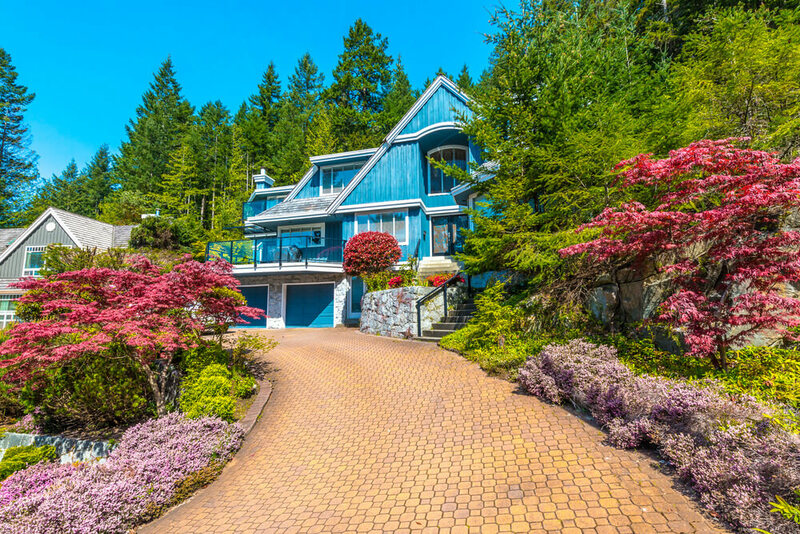 Looking at this view feels like living in a flower paradise. 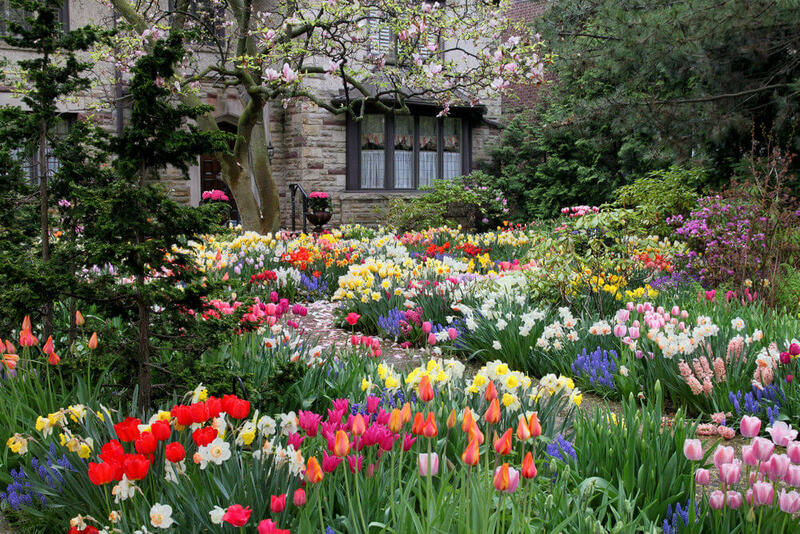 A variety of colorful blossoms like hyacinth, lirio or lily, yellow daffodils and other spring flowers complete this floral view. Green and healthy grasses spread along the way as brightly colored petunia shows its glamour along with other blossoms like marigolds. 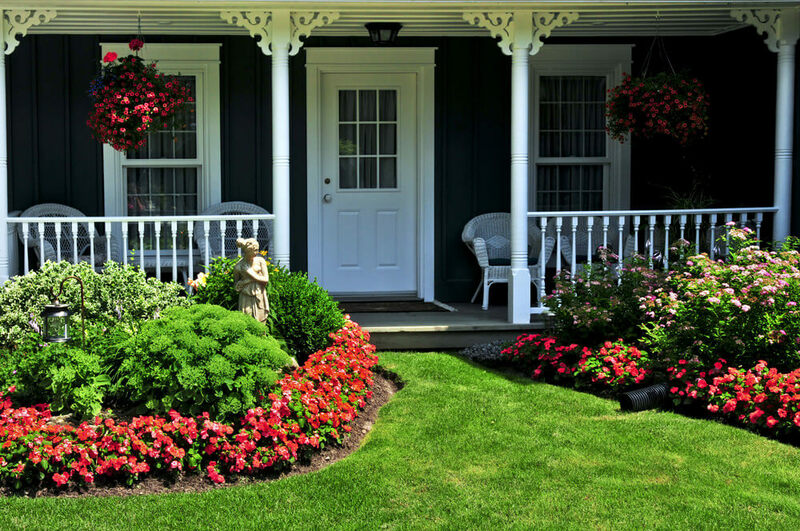 The dish-like ensemble of these trimmed ornamental plants show a one of kind design. An assembly of blossoms await on each path’s corner. 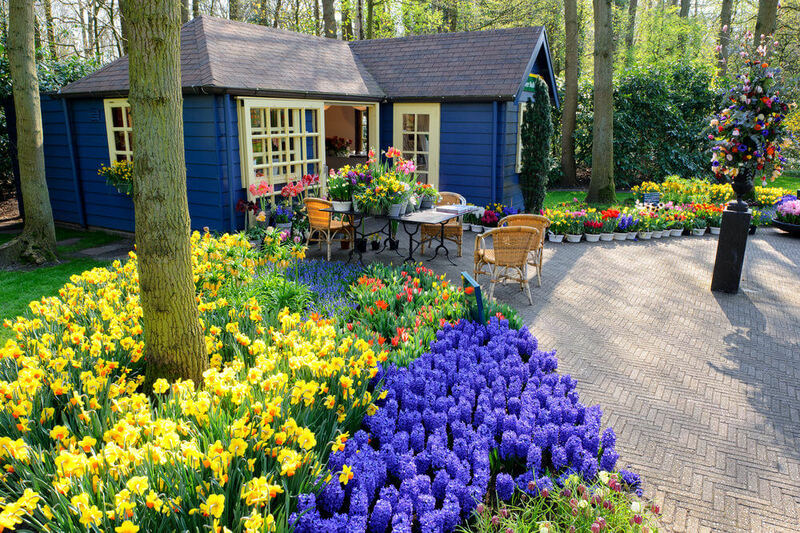 Present are hyacinths, tulips, daffodils and a flowering tree. 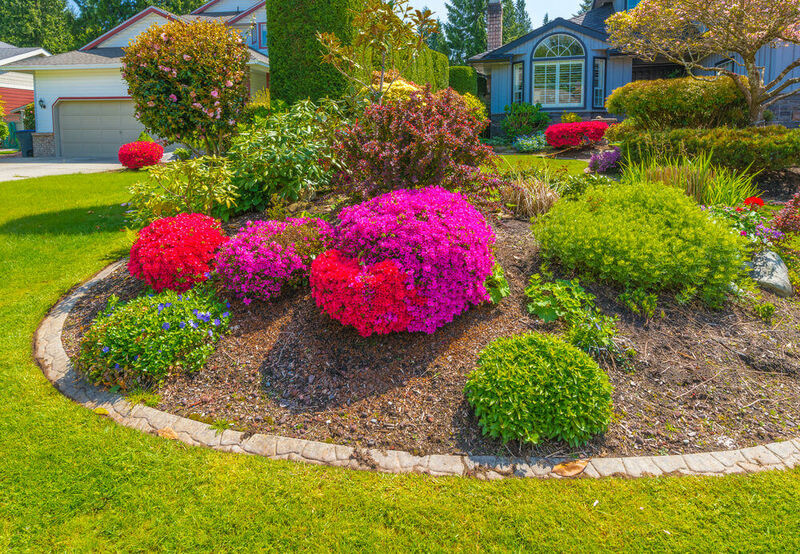 A magnificent landscape consisting of green and colorful shrubs sprouting like mushrooms from the ground. 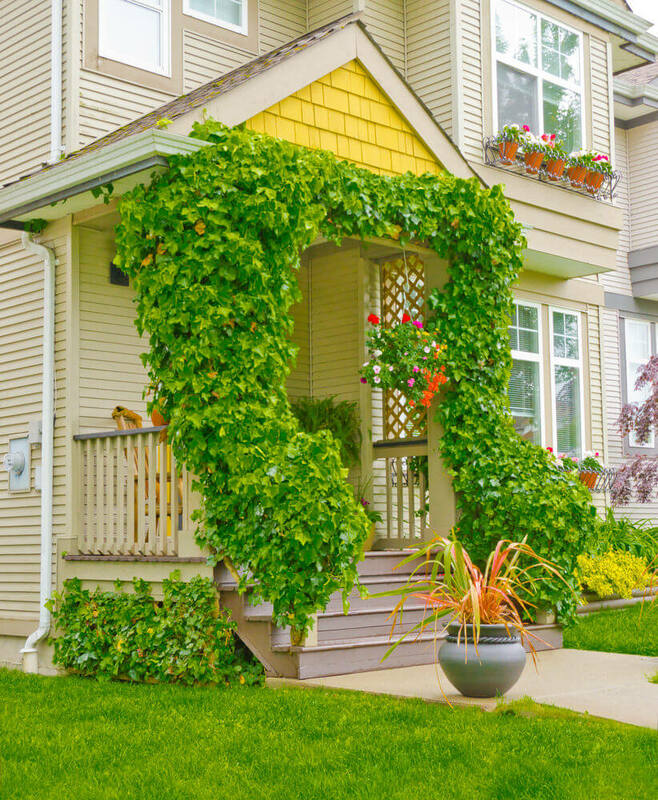 Wild green vines look even more functional as it ornaments the facade of this simple house. 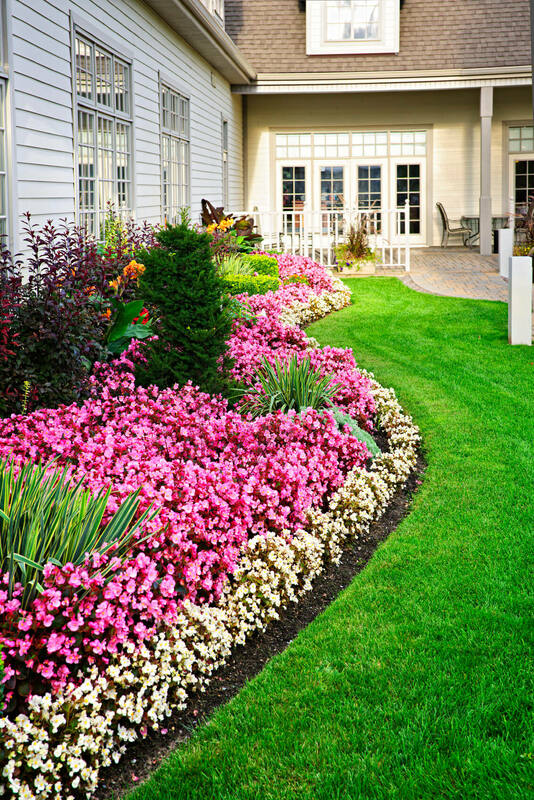 Fall in love with this spring flower inspired front yard. 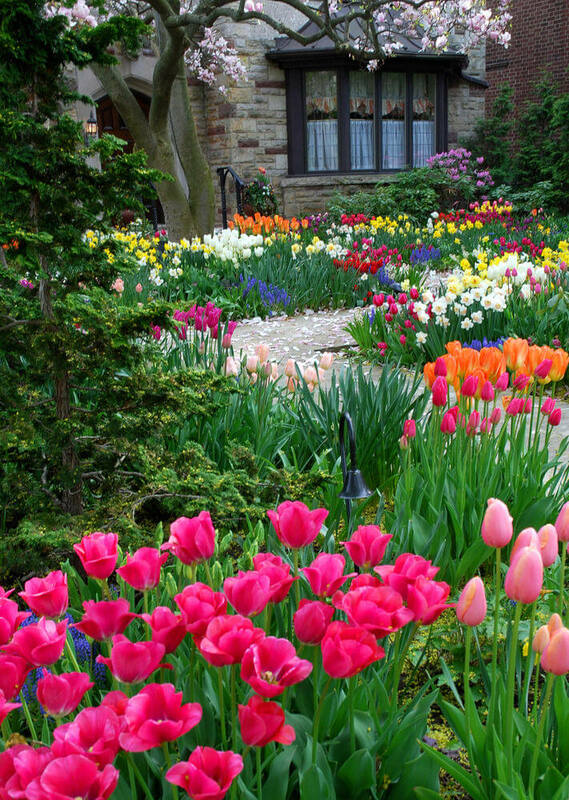 The design is dedicated to colorful tulips, daffodils, lirios, and other green plants. Not only that, the flowering dogwood stars in the scene. 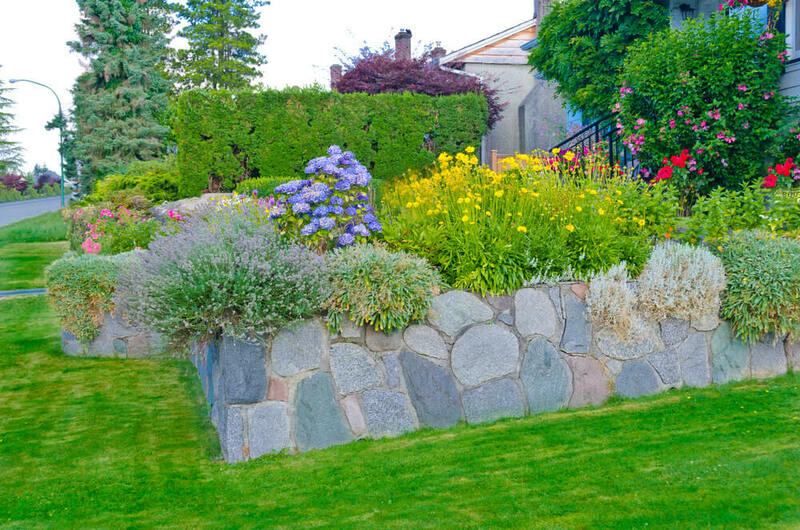 The rubble stone wall of this design is as tidy as the well-groomed grasses and well-trimmed plants growing along it. Fuschia flowers in elevated rock garden surrounded by greenery in front yard of home. Purple, pink and white petunias embrace the rock formations that are stacked into an elevation. 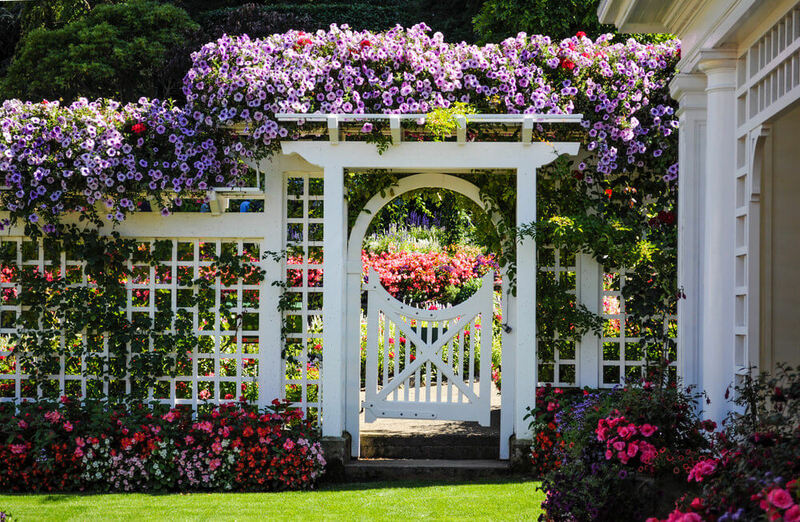 Celosia blooms and begonias highlight the fence’s view while hanging petunias are the stars fully occupying the upper view. 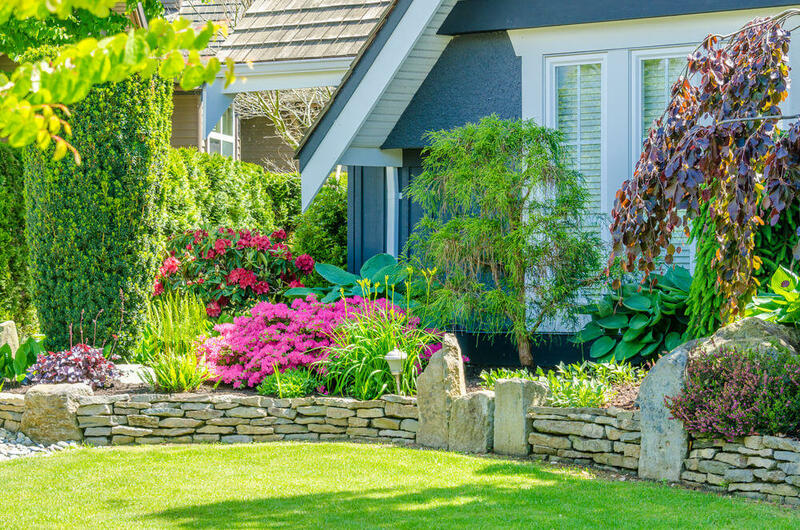 This front yard landscape is vastly covered with greenery while the nandina plants and a few petunia blossoms highlight the view. Along with the young maple trees lie petunia shrubs, while a Venus inspired water fountain peeks out from the distance. 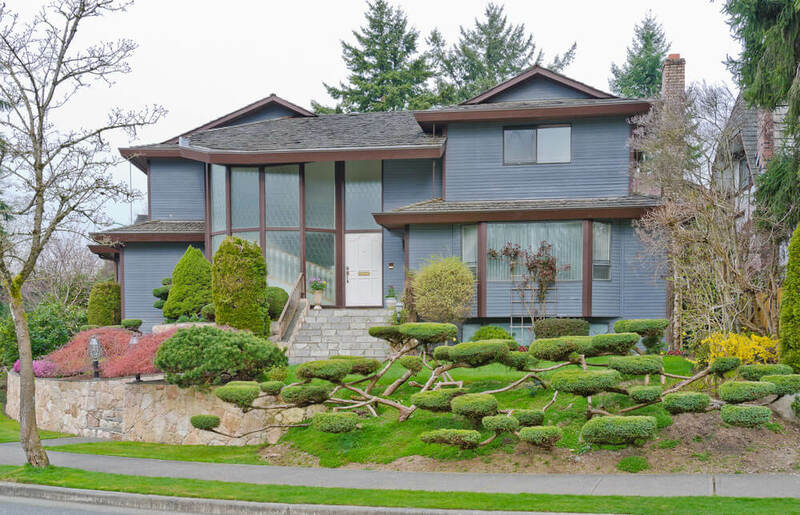 This view emphasizes coolness and a nature kissed front yard. 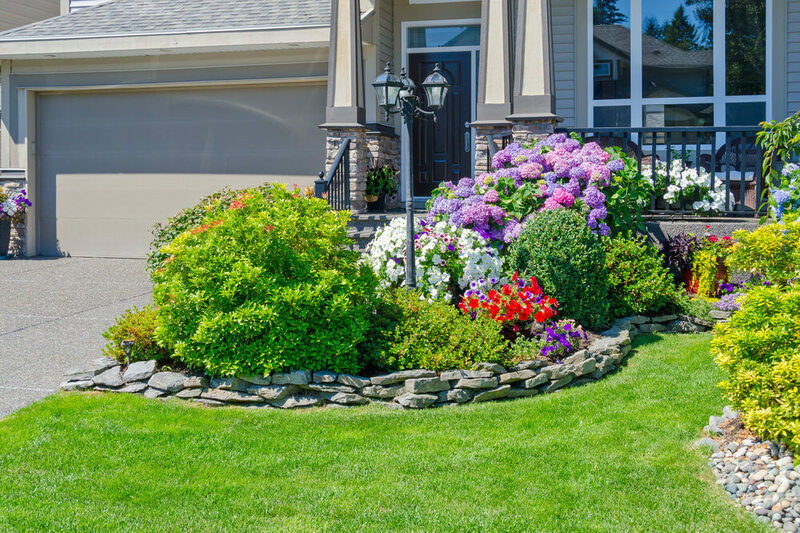 Green grasses, well trimmed ornamental shrubs and a few colorful blossoms keep it simple. 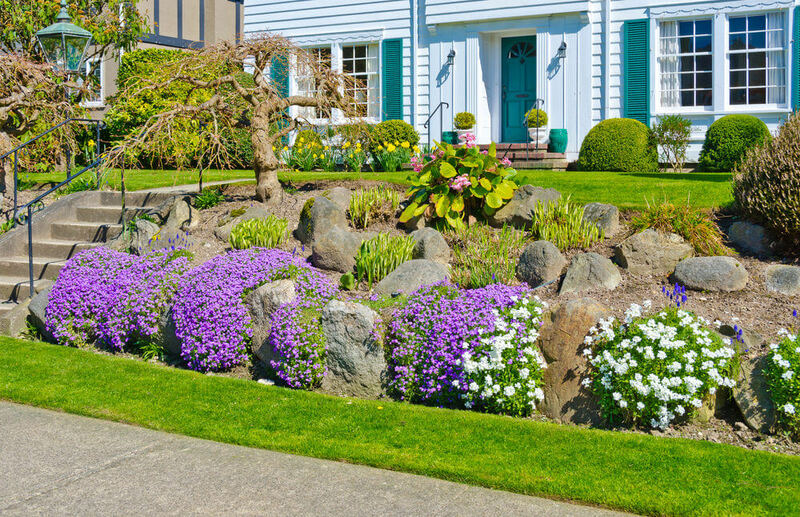 Brick stone landscape edging is given more emphasis with white and purple petunia blossoms and green grass edging the bottom. The stepped water fountain gives this plain colored house a complete scene of nature. 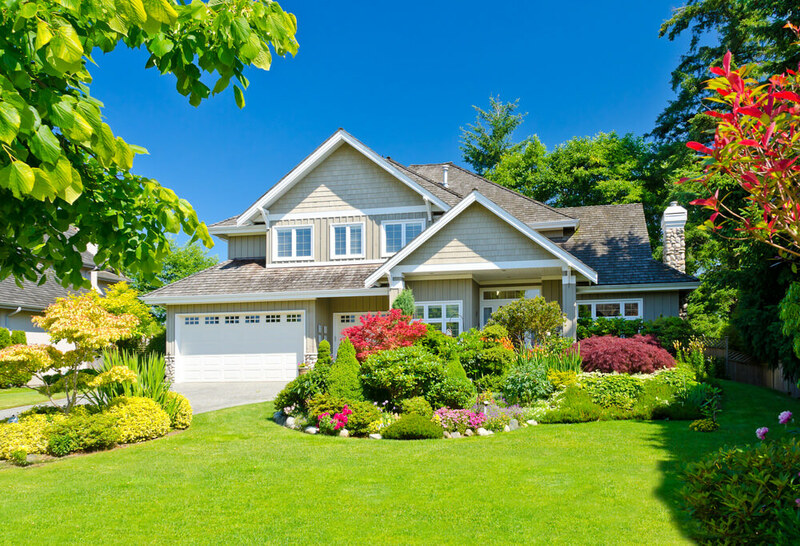 There is a vast grassland, a few trees, shrubs and an empty soil space that gives more room for plants to grow. Colored and designed stone bricks are cornered with greenery and colorful plants like mayana and marigolds. 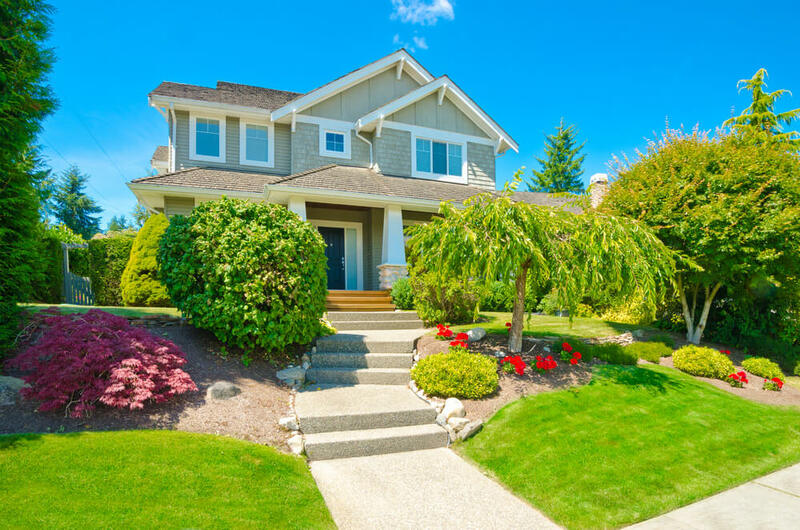 The tidy and cool view of this front yard is featured with greenery and a touch of red blossoms. 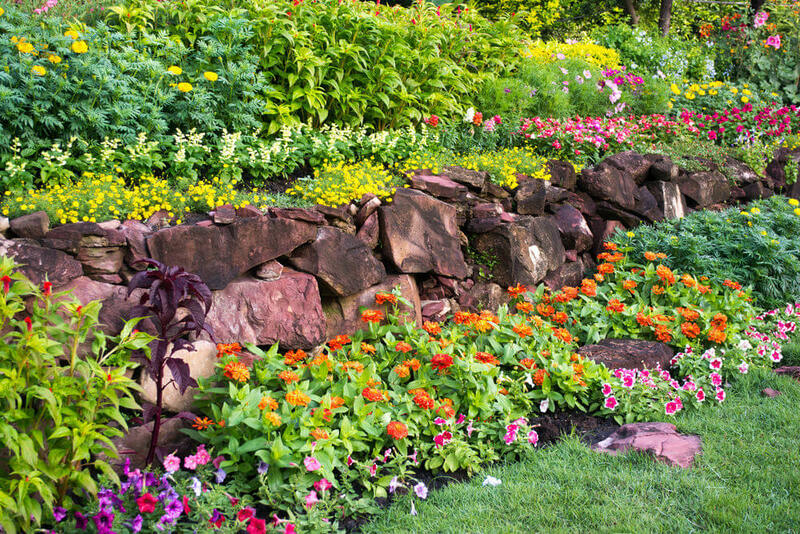 Daisies, marigolds and petunias are among the blossoms that give life to these rubble stones. 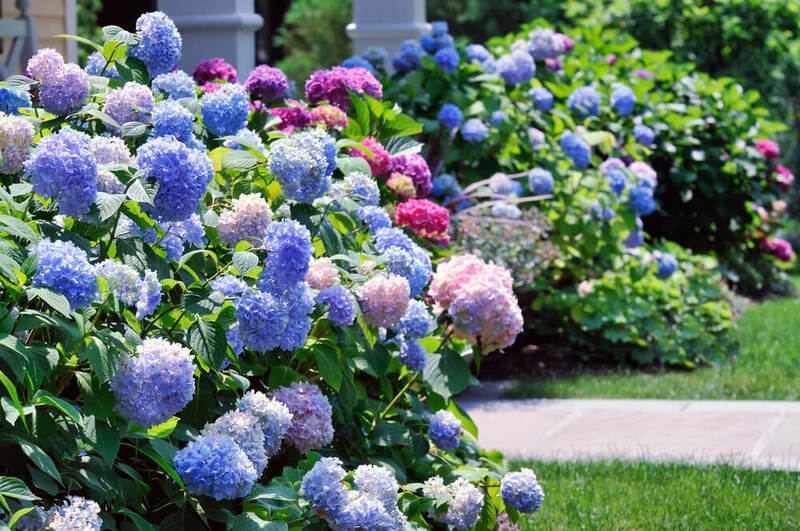 The Mophead hydrangea flowers seem to overwhelm the view with their beauty. Petunia shrubs trimmed into rounds later bloom into a colorful floral craft. 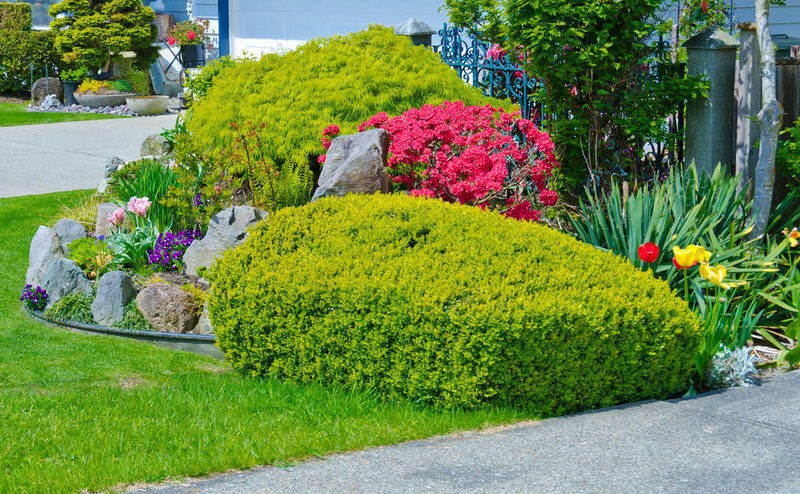 Along with these are trimmed greenery and shrubs. 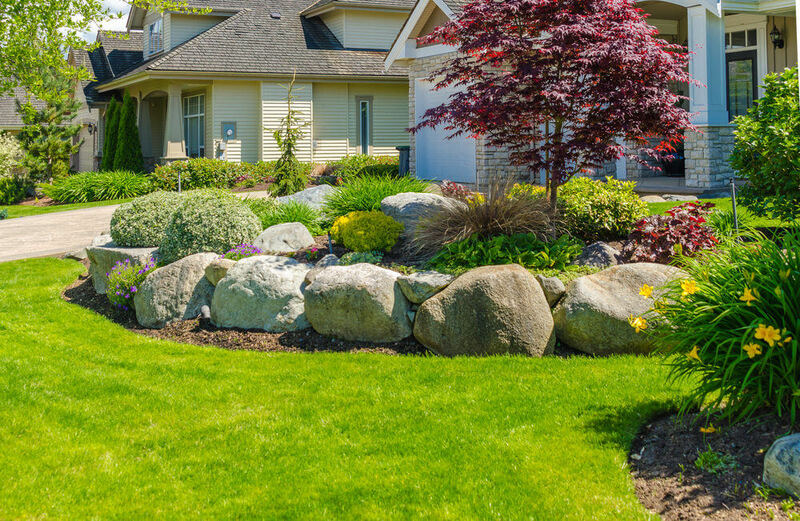 This fascinating front yard is furnished with up-sized rocks and green grass landscape. The center piece is a purple maple tree. 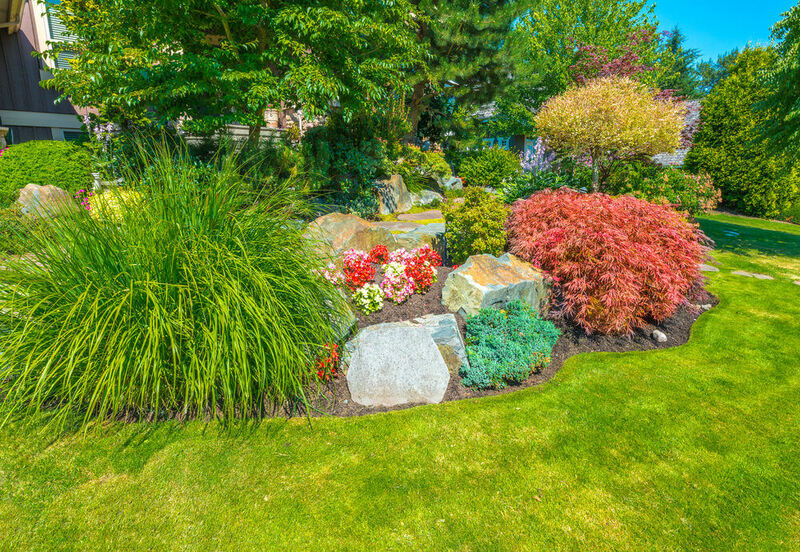 The neat and well-groomed grass is furnished with large rocks, trimmed shrubs and colorful flowering bushes. Rubble stones and landscaping grasses delight an otherwise gloomy looking view of this garden. 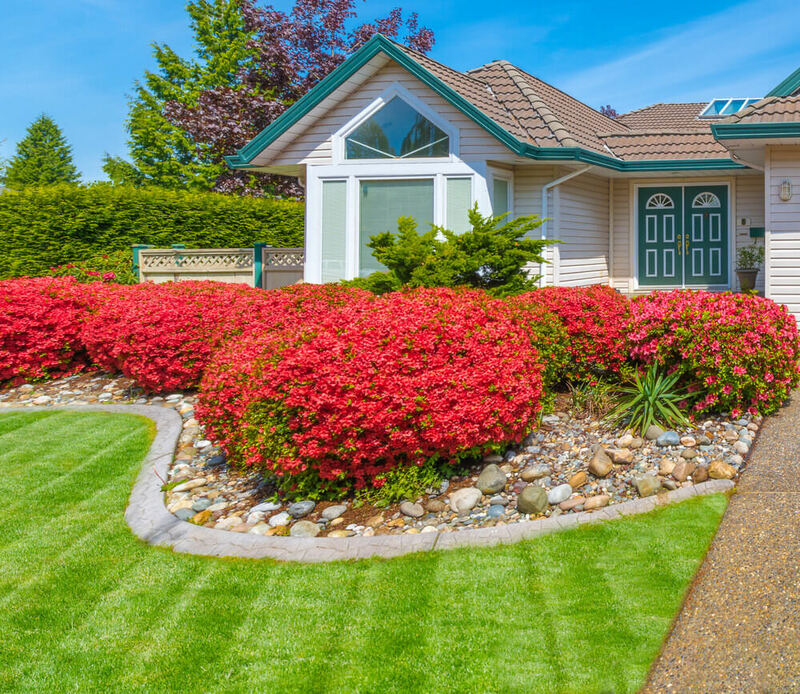 Large round garden with bright pink and red flowers with brick edge in front of 1990’s style home. 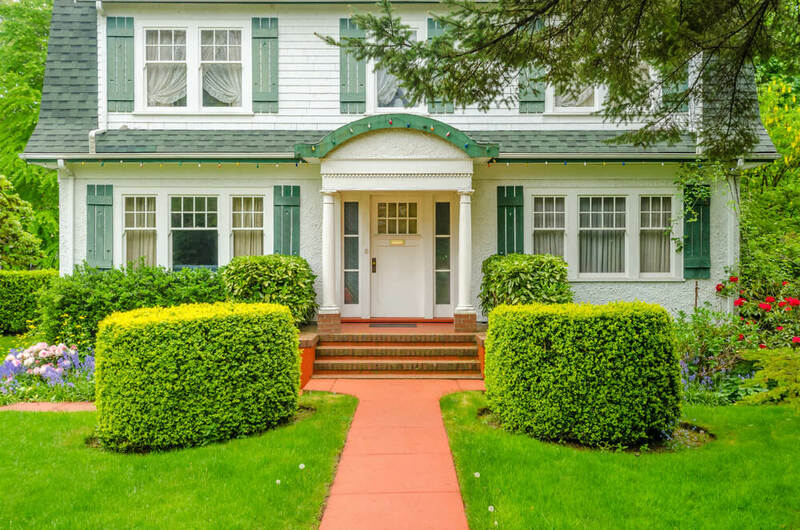 A simple path turns into an elegant alley of greenery. 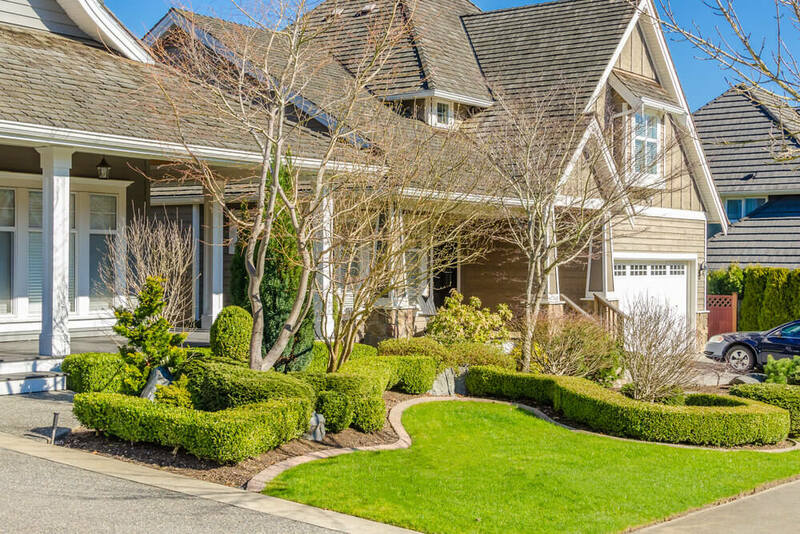 Featuring landscape grasses, pines and trimmed shrubs. Plain grasses beneath the elevated landscape of green shrubs overgrowing on the edges. 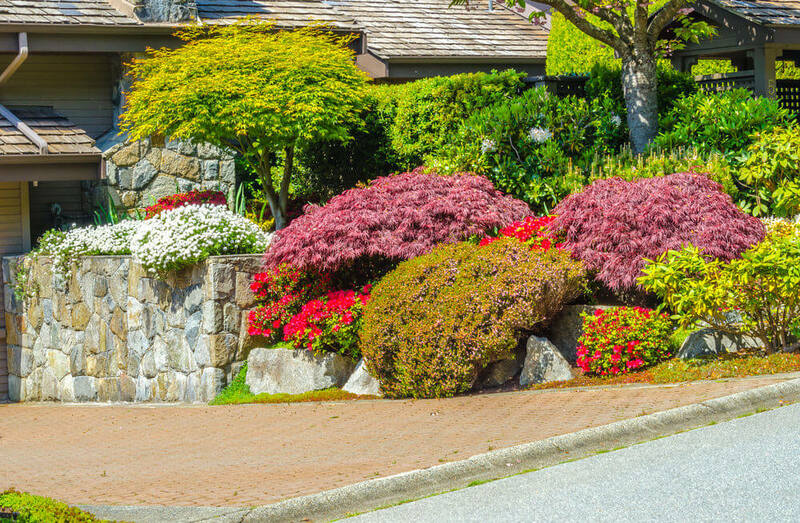 Non-flowering shrubs are also a great colorful ornament for your front yard. Nandina plants and landscape grasses are a good match. Add trees and a few flowers. 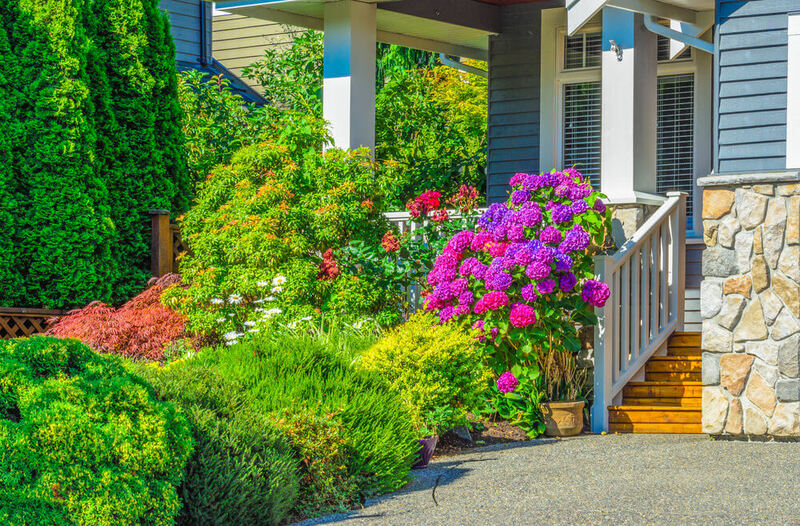 A simple path and a pebble foundation when ornamented with green shrubs and colorful Mophead hydrangea would look as peaceful and charming as this one shows. 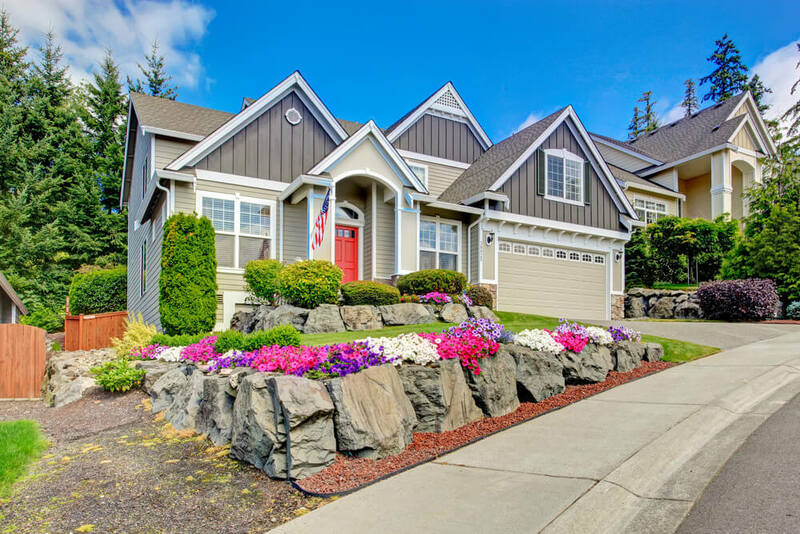 This may look plain and grey yet when decorated with huge rubble stones and colorful petunias, it looks very pleasing to the eyes. 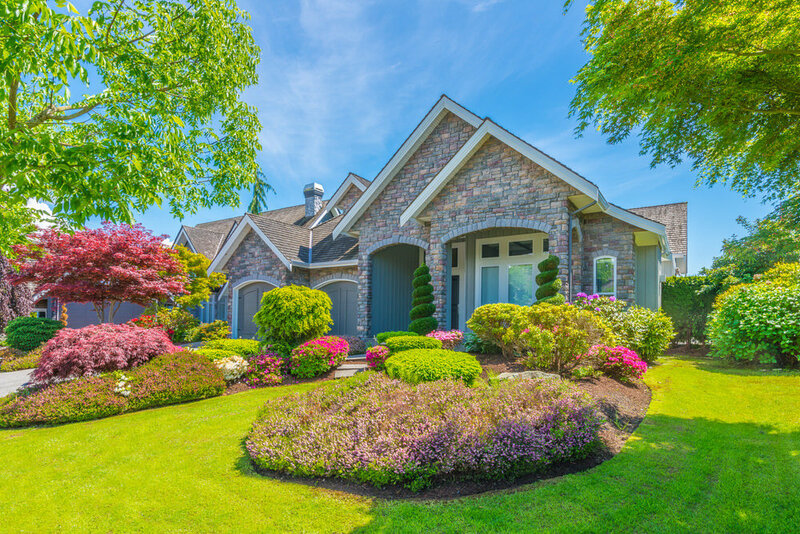 Plants may have outgrown each other yet the rounded brick stone paver edging still looks fabulous as blooms turn out to be a mixture of colors. 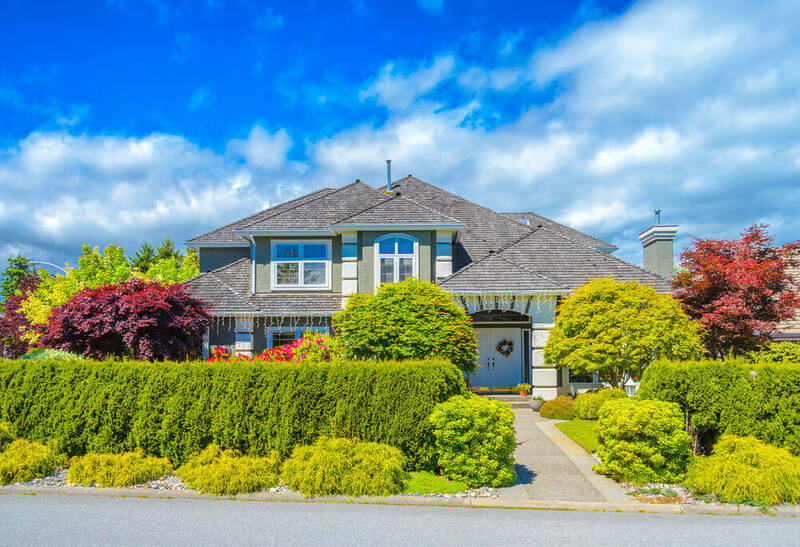 A few purple colored nandinas and a maple tree is enough to highlight the greenery view of this front yard. 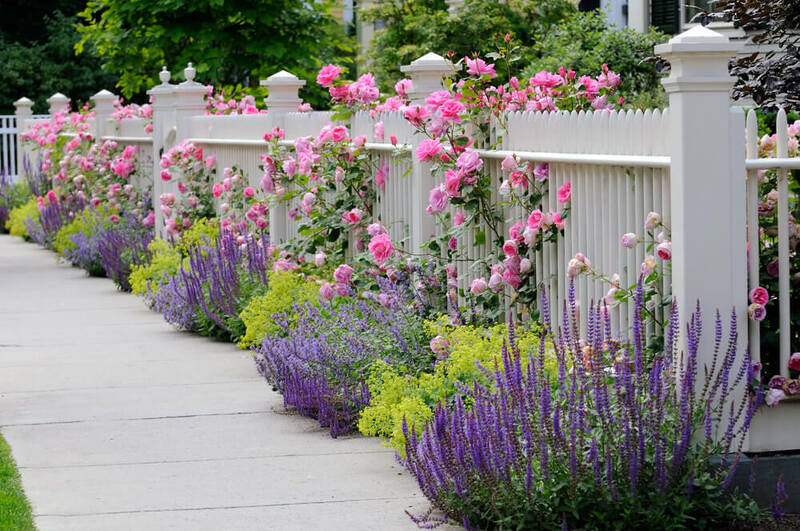 The full-bloomed pink roses beautifully peek out the gaps of the fence. Vibrant! The blossoms seem to look like a rainbow tossed on the grassy rounds. 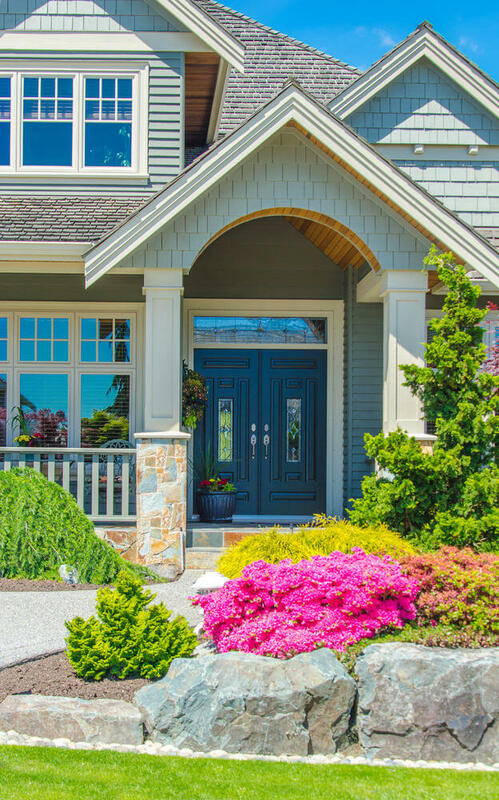 The white painted facade looks even more vibrant with colorful blossoms and greenery. These plants are trimmed to resemble a line of balls ready to roll. This feels like a breezy pine view. 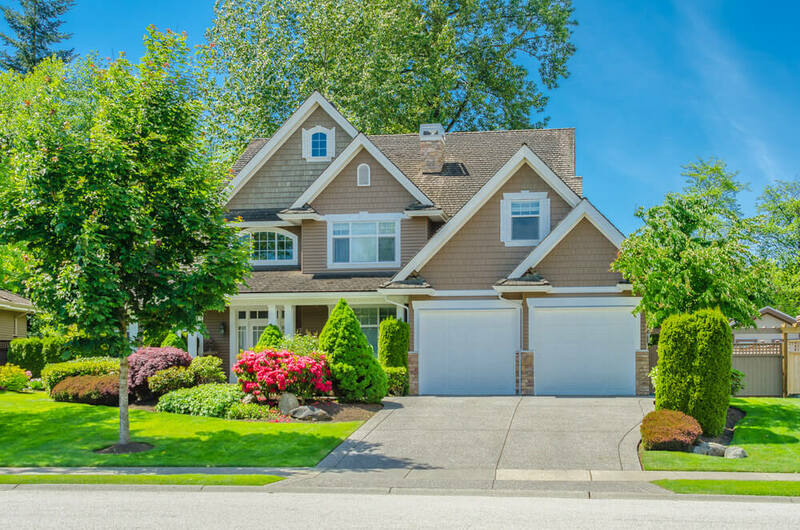 A wooden and brick stone inspired house is furnished with green ornaments along a sloping driveway. 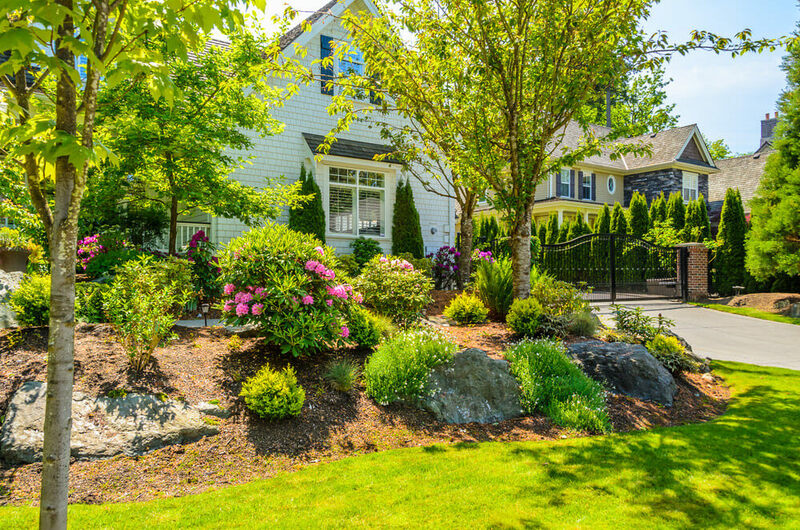 A well-balanced front yard ornamented with medium sized rocks, small trees and trimmed shrubs. 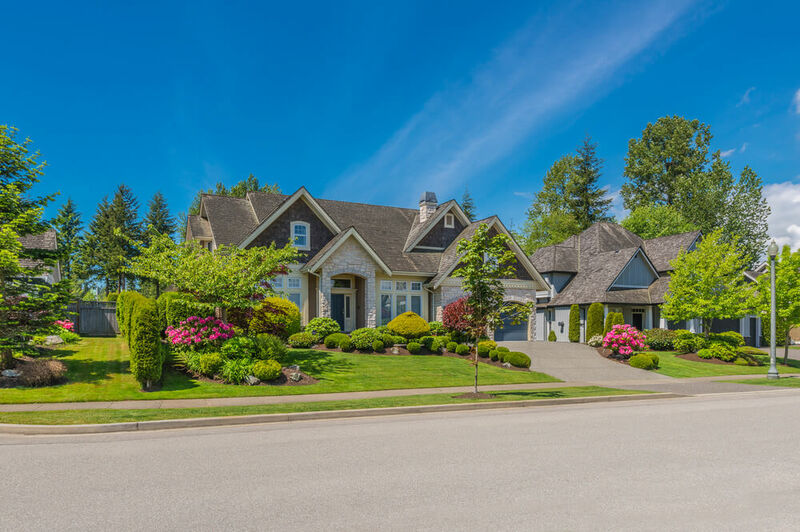 Shrubs trimmed into different shapes and sizes, well-maintained Bermuda grass and sheered medium size trees offer a simple yet inspiring delightful view of this front yard. 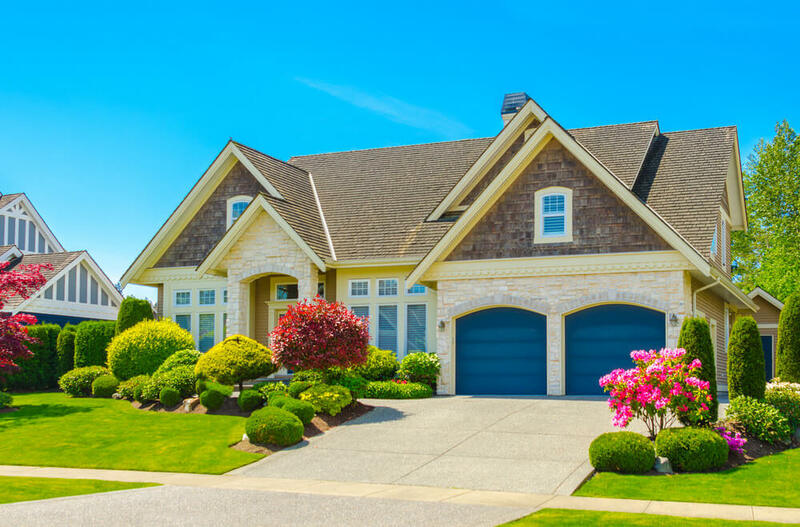 Green plants trimmed into triangular and rectangular forms look like robust guards on the garage way. Trees, grasses and flower blossoms also accompany these. 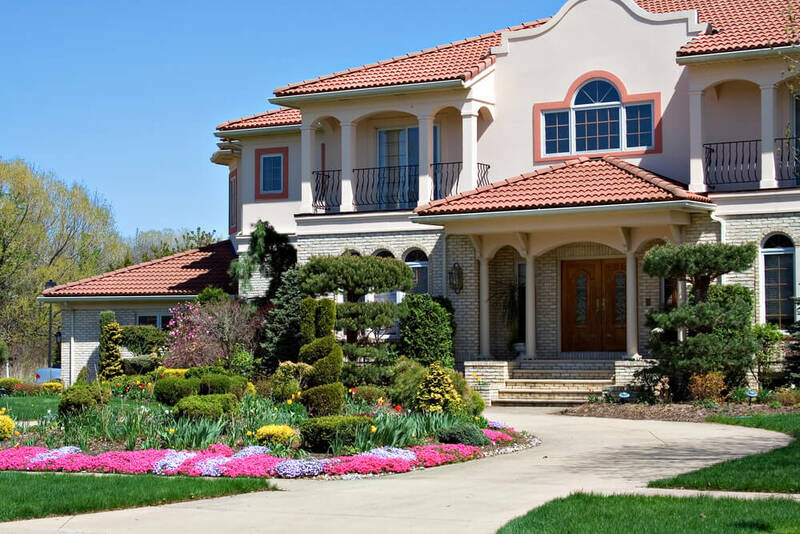 The fancy house decoration is paired with bushes of colorful petunias and green shrubs. Along with these are huge rocks assembled to provide elevation to the landscape. 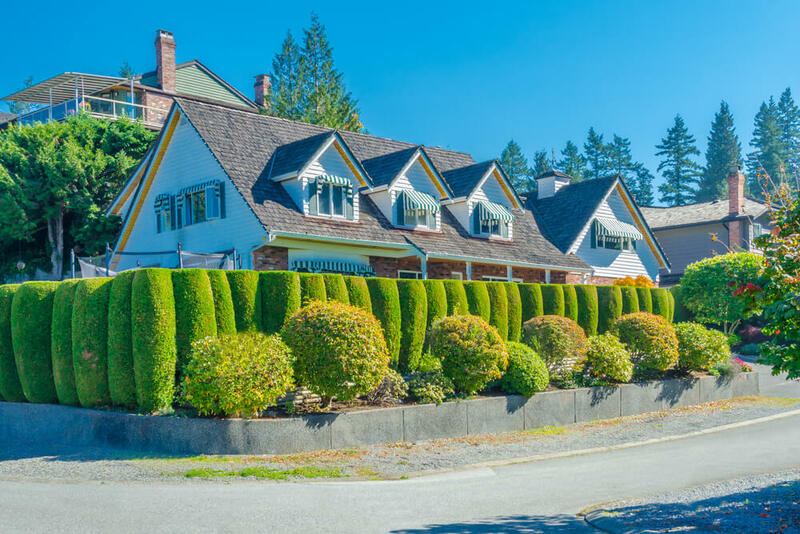 Modern styles are getting fond of trimmed plants known as topiary, which is the art of clipping plants into ornamental shapes. Elongated, round and triangular are some of the fancy forms of these. A simple touch of purple and pink blossoms and leaves gives life to a plain colored landscape. 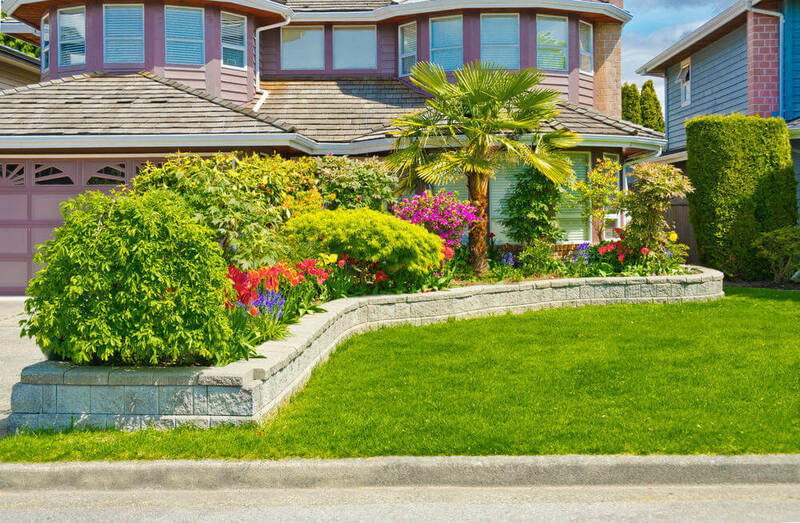 Brick stone edging looks more fabulous when ornamented with landscaping grasses and colorful blossoms. 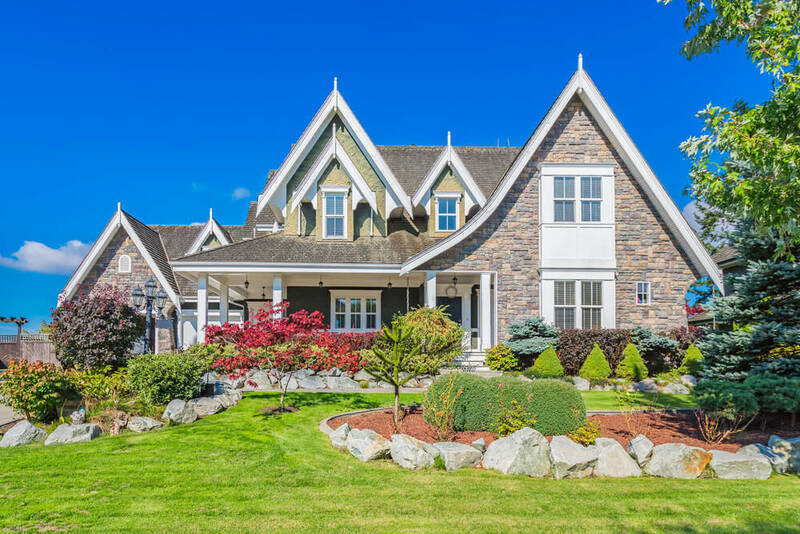 The spiral trimmed topiary standing right in front of the brick stone house has their own spotlight while the purple leaves of nandina and maple tree along with other blossoms gives a touch of colorful sight to the whole landscape. 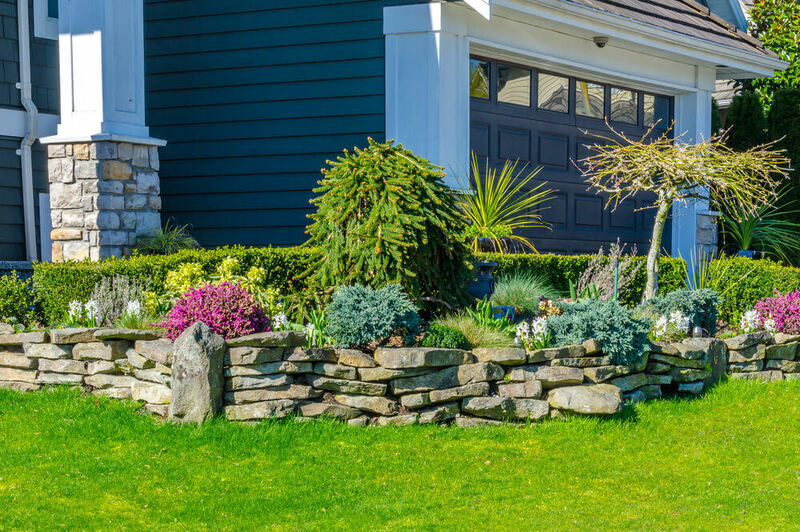 Green walls, topiary balls, spiral topiary and a few blooms furnish a plain and rocky garage way landscape. 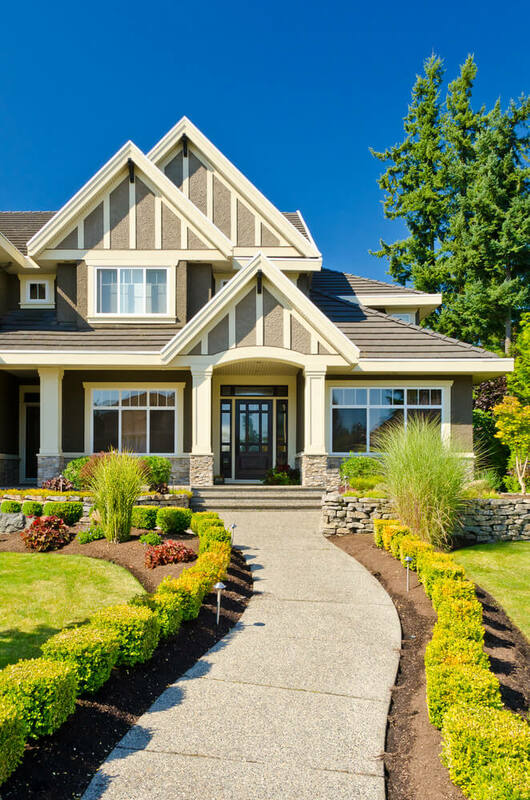 Turf grass and green shrubs provides shade along with an eye-pleasing view for this front yard. 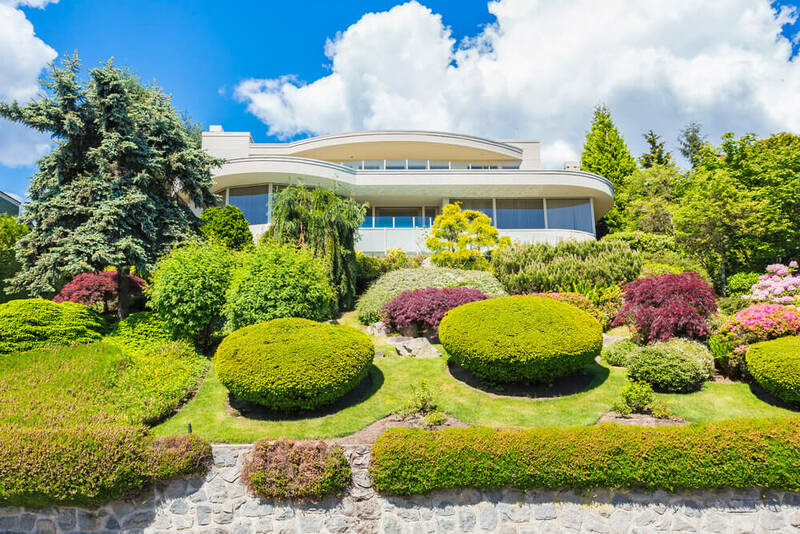 A few round topiary and green walls add an embossed mood to the view. 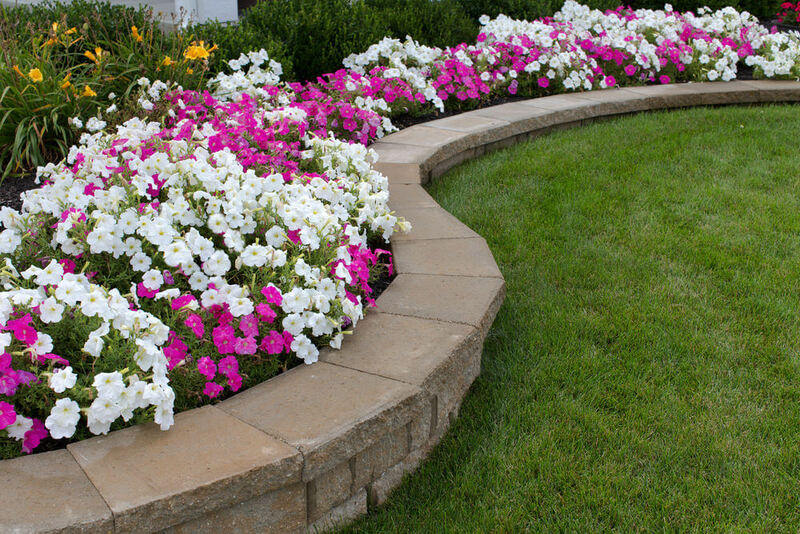 A rocky landscape edging idea where bushes of blooming petunias and newly lawn grasses are found. In addition, a green pine shrub is found in the center of the garden. 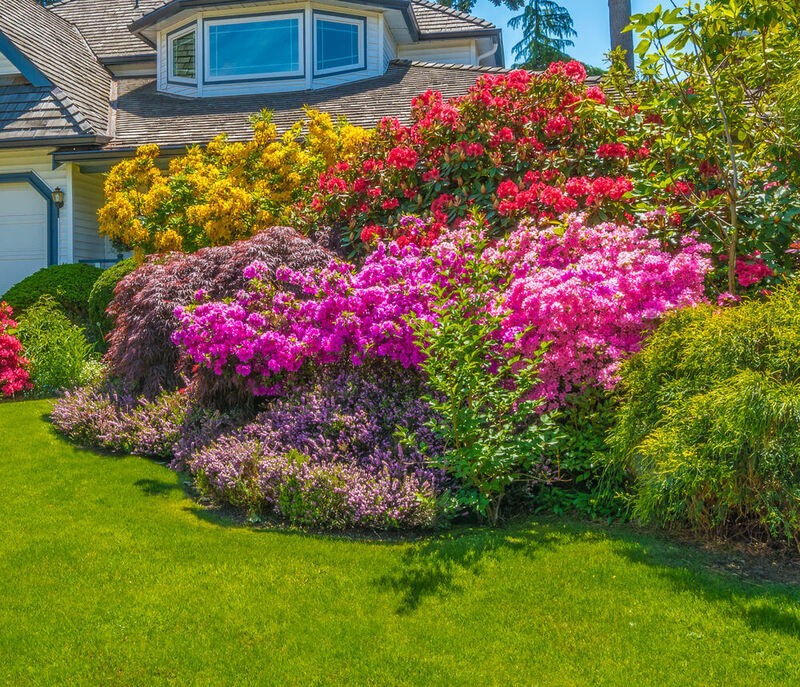 Colorful blossoms assemble in a thick and sheer view of a glamorous front yard. Edging on the corners are well-maintained turf grasses. As you can see from a distance, a pair of red vine ladders are leaning on the brick wall. This will later bloom beautiful flower blossoms. 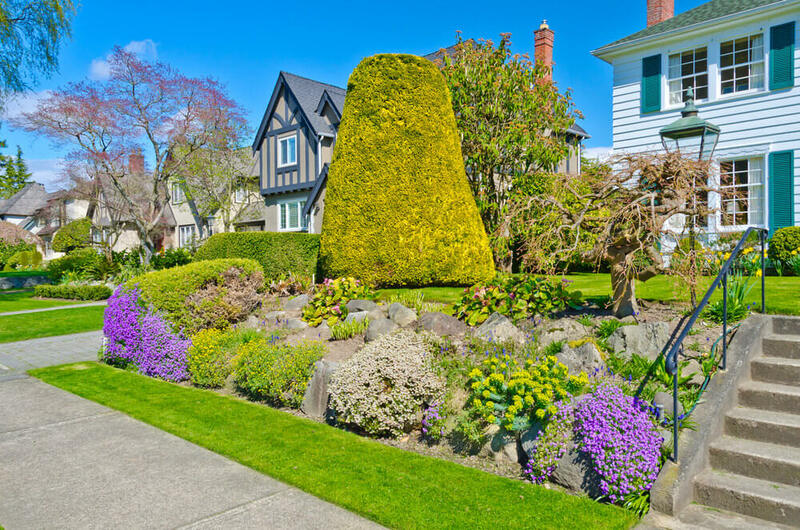 In addition, a few pansies, purple knights, round and square topiary share the view. 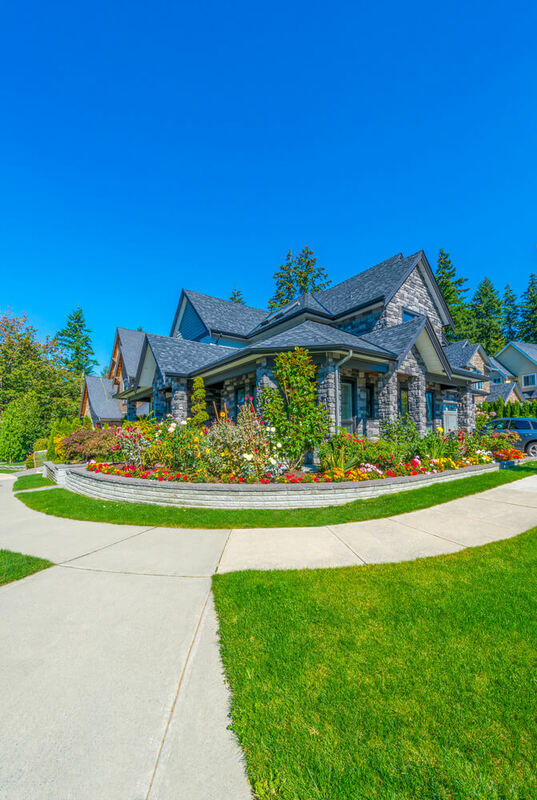 Blue skies reflect a great ambiance towards the stone house, colorful blossoms, rounded sidewalk and round brick paver edging. 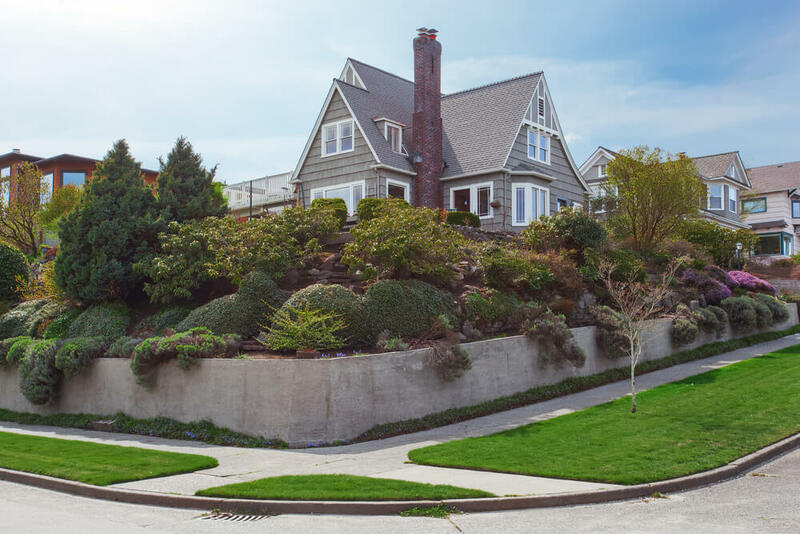 This is a front yard inspired with a stony edging accompanied by huge rocks, green shrubs, and weeping Alaskan cedar trees in between. 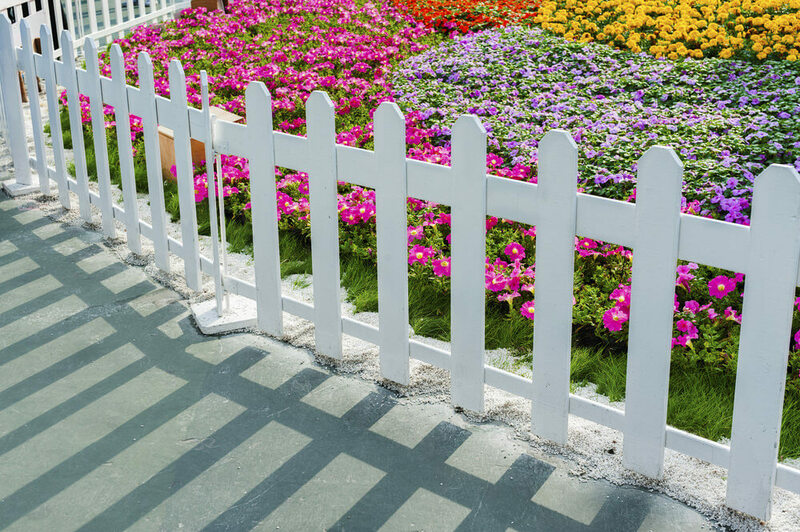 A short and white wood fence encloses colorful pansies, petunias and chrysanthemums. Edging from the concrete sidewalk is fine white sand. Along a brick path grows maple trees, purple and yellow blossoms. 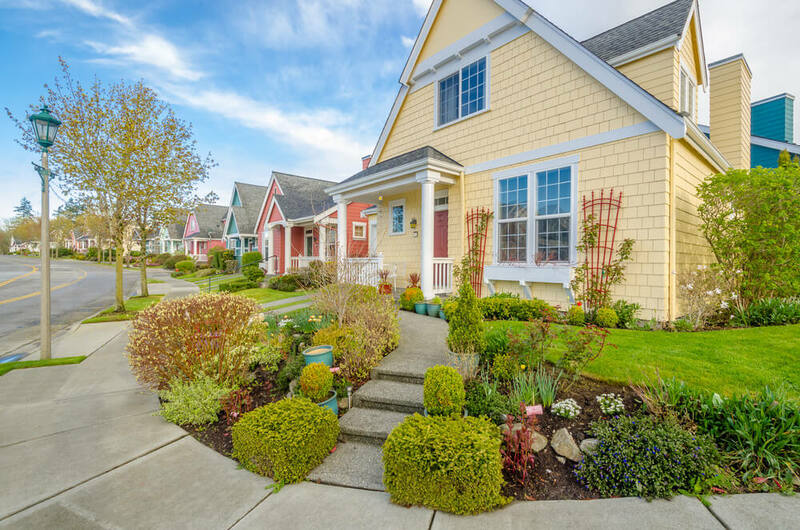 In addition to this are landscape grasses and trimmed shrubs lined along the rows. 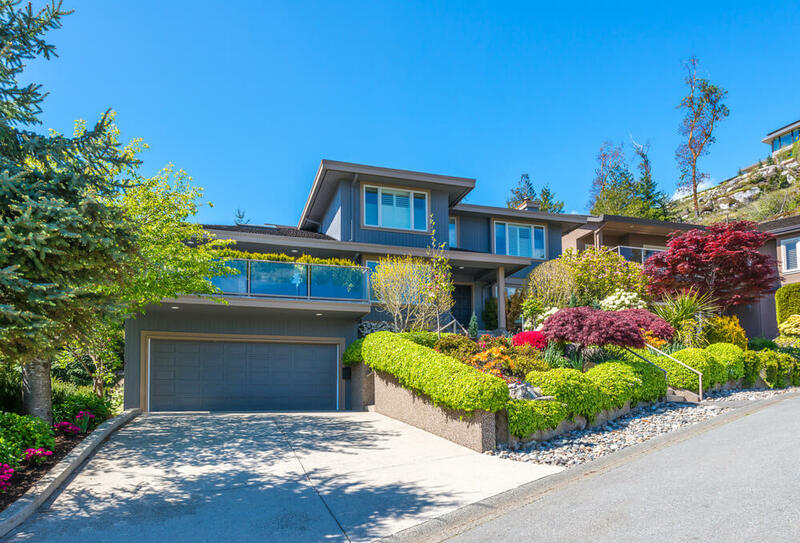 Down the sloping pathway lies gigantic green walls and colorful blossoms growing on brick stone flower box steps. Pines are also growing in the distance. 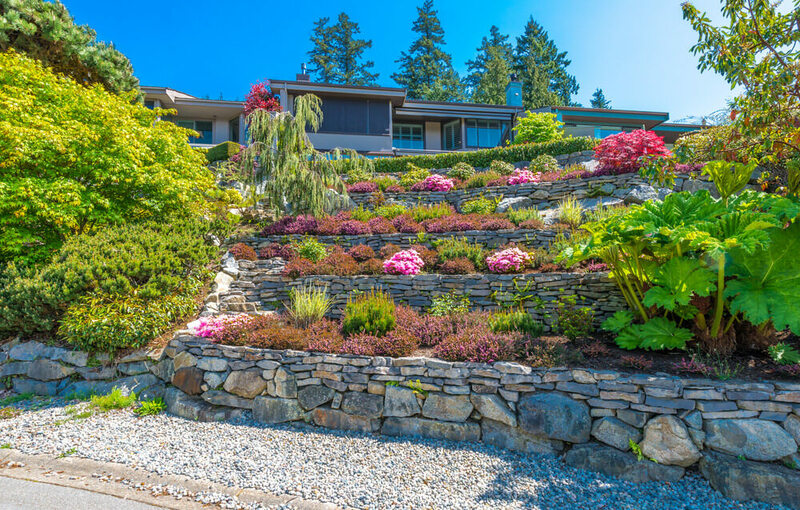 This view of terraces is made of brick stone flower boxes with greenery and flowering shrubs growing out of them. 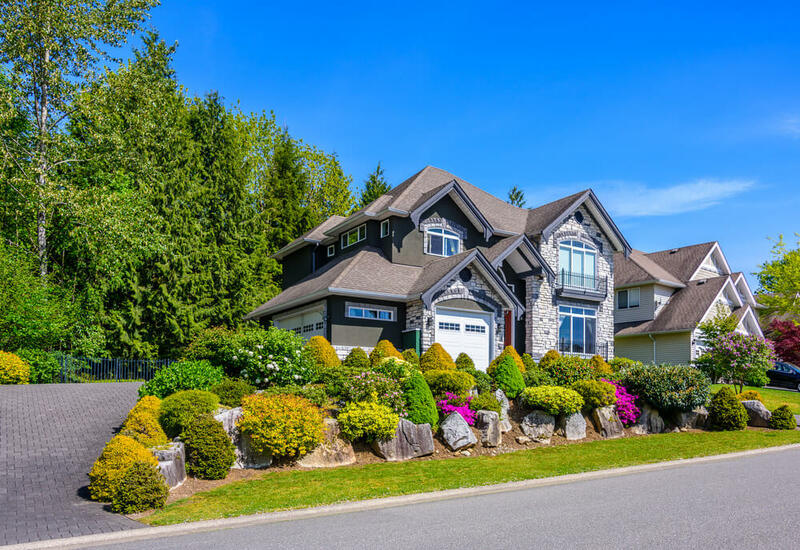 This sloping landscape features large and smaller topiary balls with nandina plants, pine trees and some greenery, perfect for a simply designed vacation house. 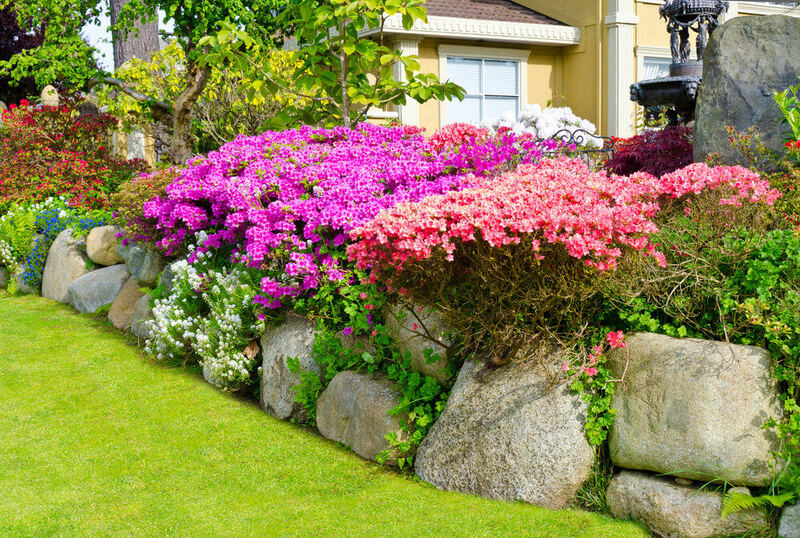 A brick stone pathway and rubble stone flower box grows purple shrubs and other blossoms. Tall and thick green walls are growing well in a pebbled concrete flower box. Furnishing it is a pile of bamboo, stones, pansies, and a Japanese Palmatum maple shrub. 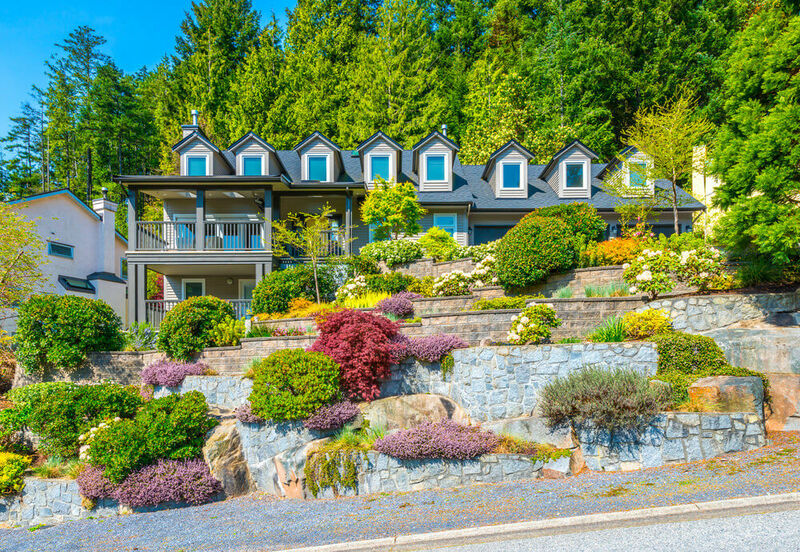 This house is positioned perfectly on an elevated surface, which gives rise to brick stone flower boxes to form colorful terraces. 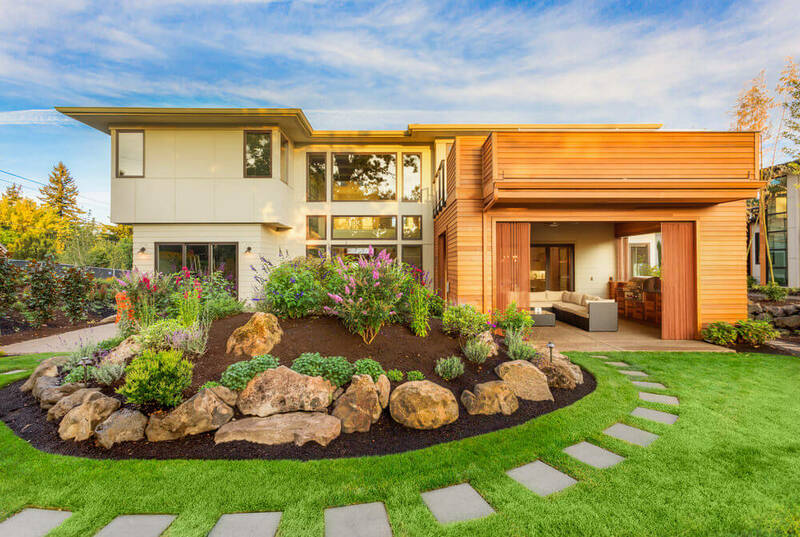 A simple American house design filled with landscape grasses and flowers, from its wooden steps down to its sidewalk. 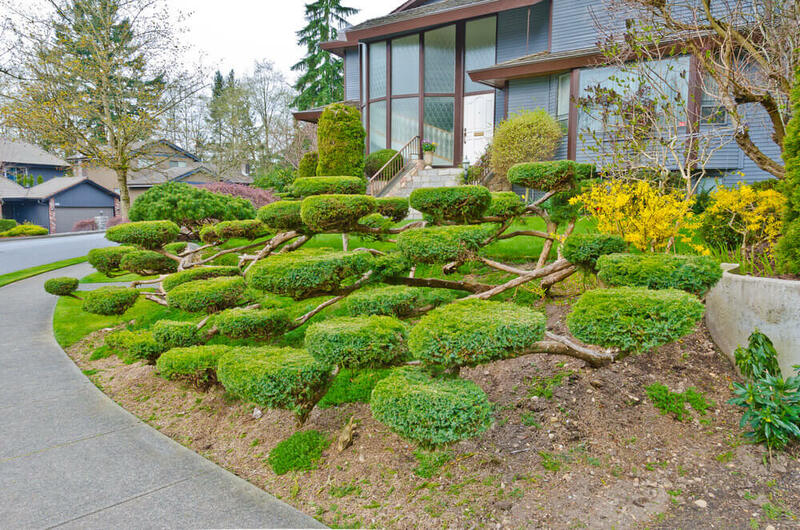 One of a kind topiary, at its finest design ever made; average sized topiary balls and well-trimmed green walls. 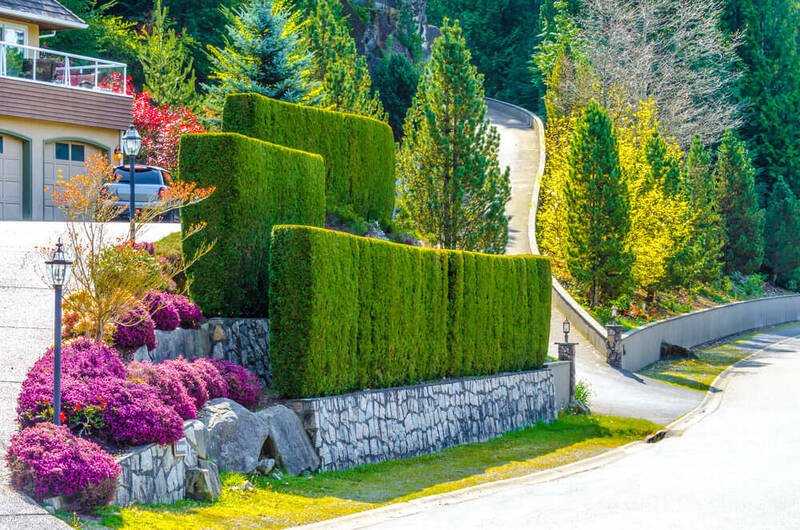 These cylindrical shaped hedges are one of creative designs recorded in this list. 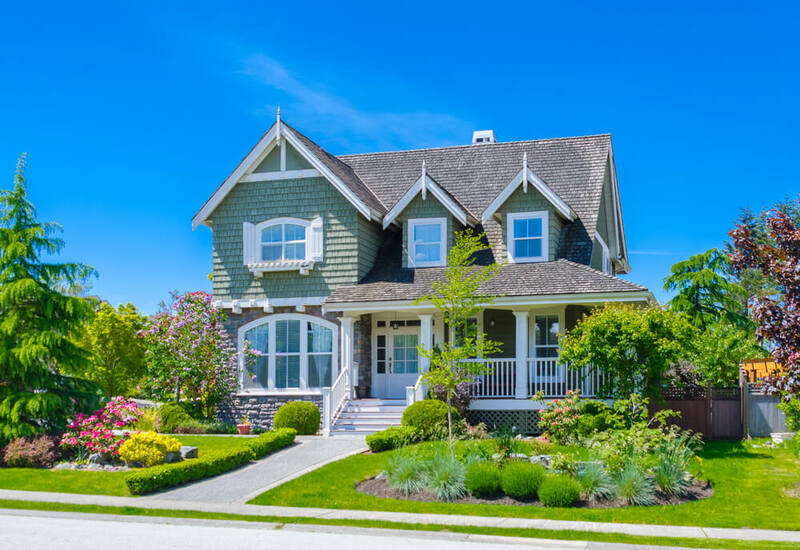 The soulful leafless tree reveals a dramatic and nostalgic mood while it complements the monochromatic house paint, while the well-groomed greenery on the ground neutralizes the gloomy mood. 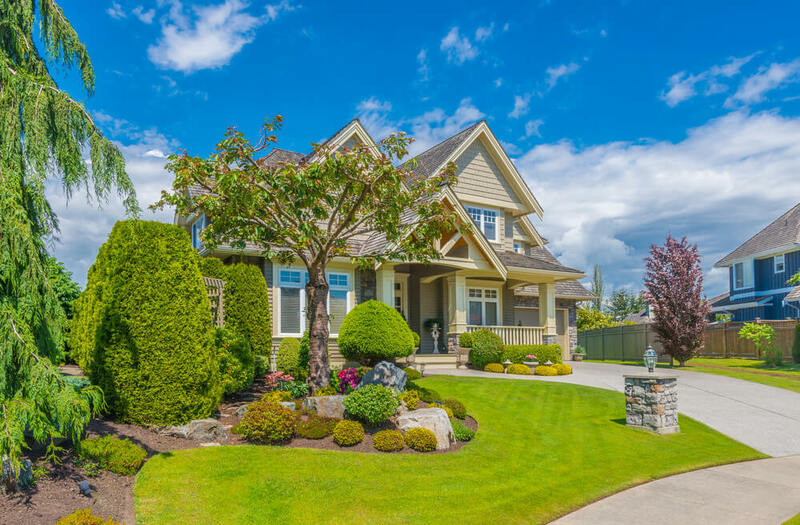 Green shrubs specially grown in the flower box edges emphasize the build and uniqueness of the style, while the center pieces like the maple tree and colorful blossoms highlight the landscape. 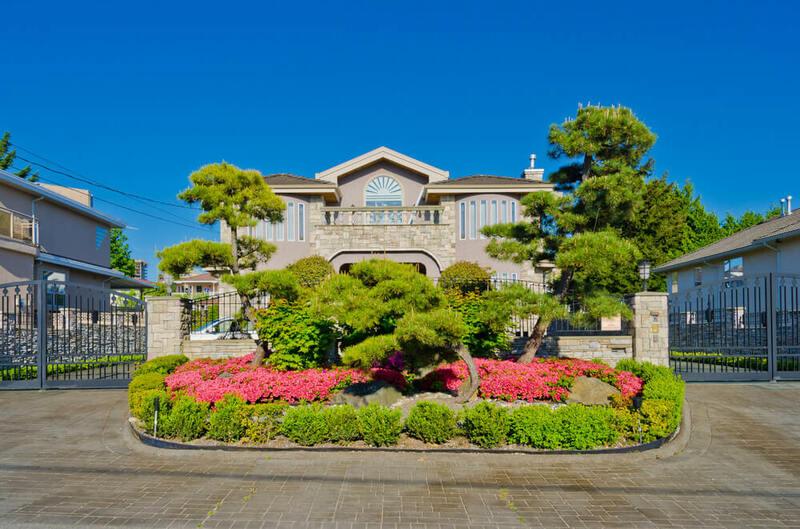 The blue house attracts most, thus the colors from its surrounding must also blend to balance a good view. 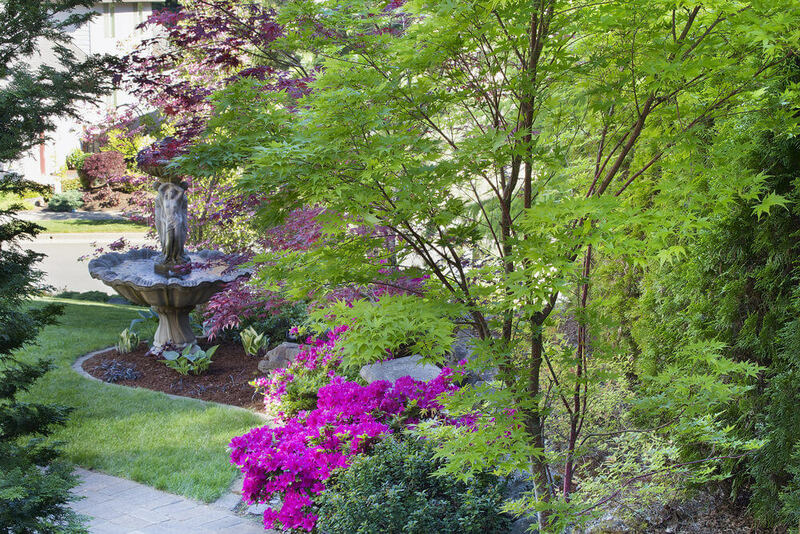 The color of the brick pathway, Japanese Palmatum maple trees, green pines and shrubs are a good combination. 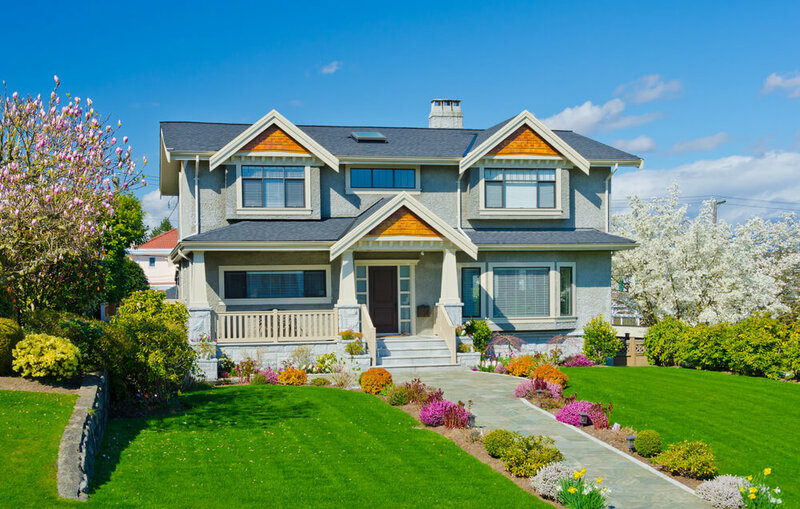 This house is one of modern architecture, designed with a flat rooftop, natural house paint and simple front yard landscape. 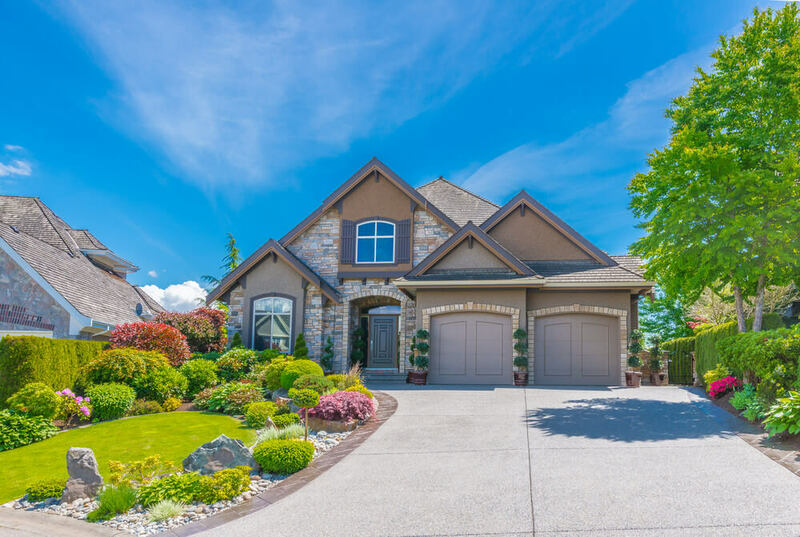 The landscape is filled with a thick and green turf grass, a pathway encircling it, large stone edging and a few ornamental plants. 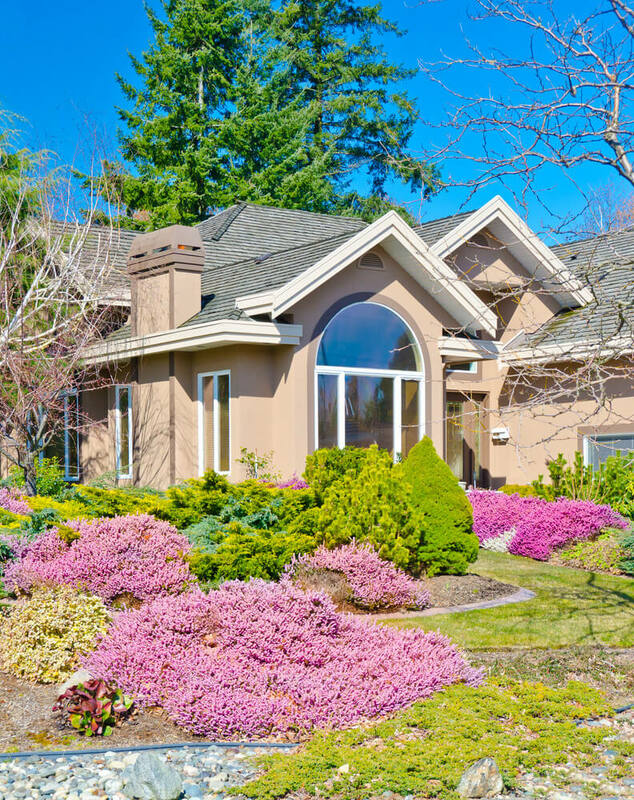 The Erica Carnea shrub edging on the grass is emphasized as this is the only pink shrub among the greenery. 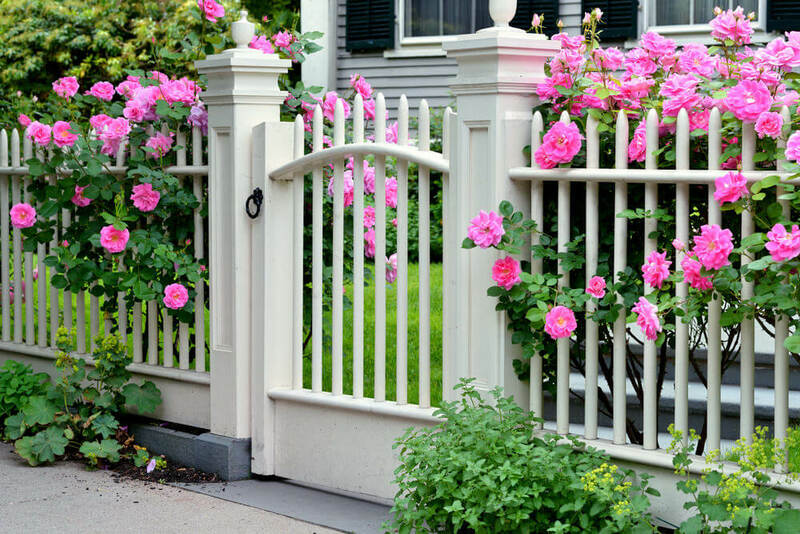 This is a great floral garden gate idea. 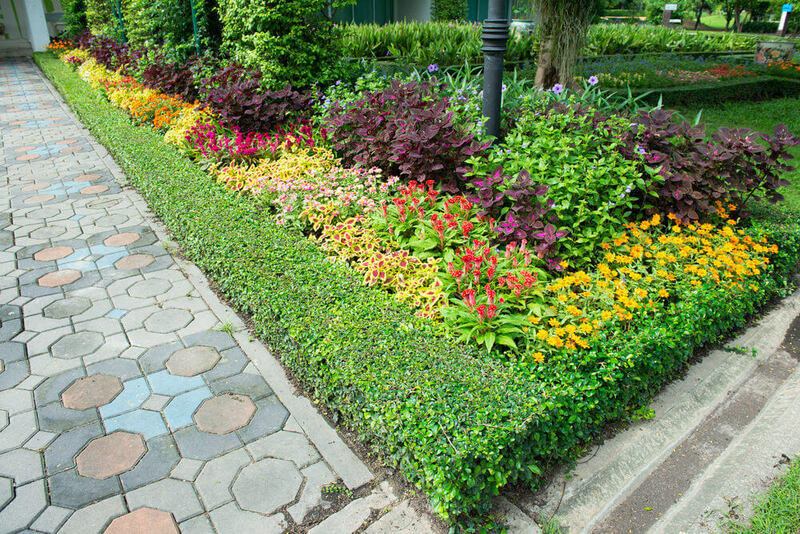 Colorful vine blooms and flower shrubs on the ground give an overwhelming welcoming presence. Inside is even more floral and paradise like. 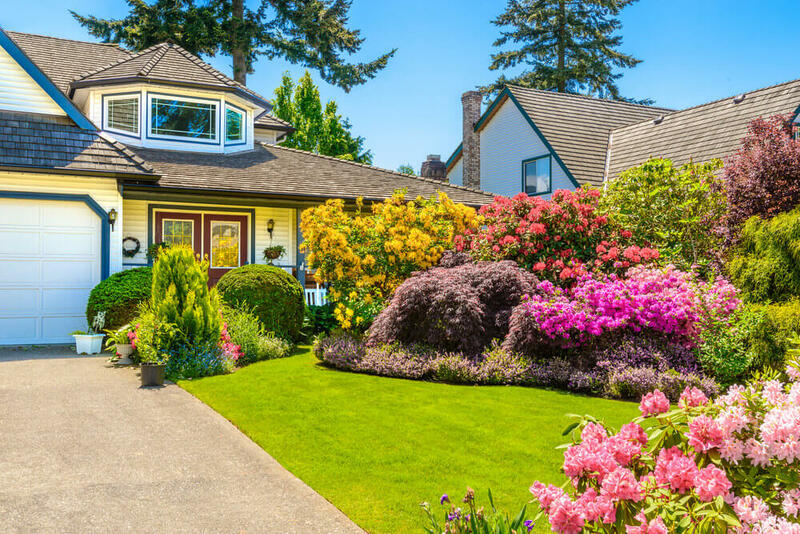 Weeping Alaskan Cedar tree, Japanese Palmatum maple shrub, green turf grass, a few blossoms of mopheads and pansies complete the set of a perfect front yard garden idea. It also includes greenery, round and spiral topiary. This full grown greenery is untrimmed yet is still beautiful and captivating. The over-sized topiary stand still and magnificent among other landscape elements. Rocks and grasses let the other landscape elements lay resting on them as they give a cool and calm view. 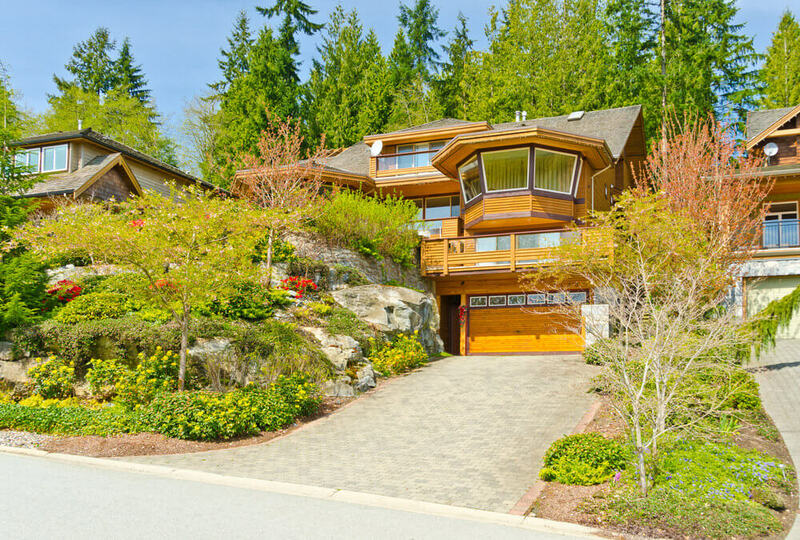 A wood house architectural design resting on a sloping surface with a large rock formation beside it, where trees and other greenery grows and sprouts. A cool water fountain from a large rock gives a refreshing view. 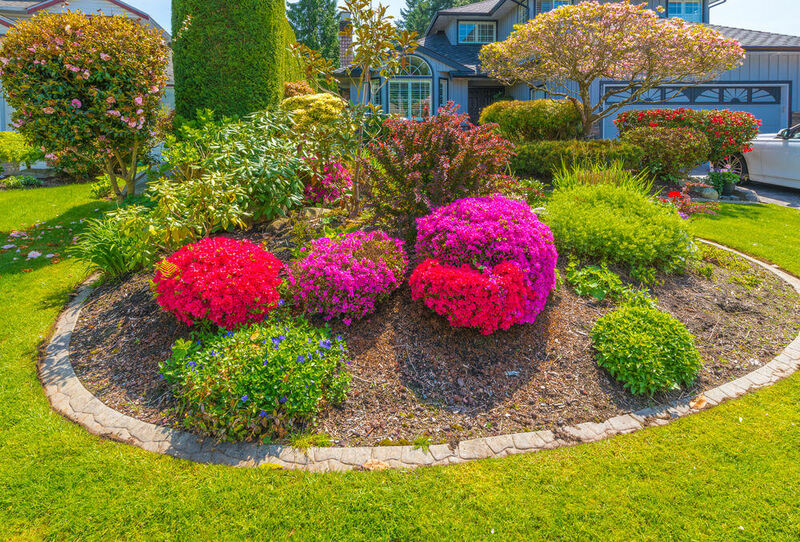 Around its edges are stones and grasses while blossoming mopheads and petunias gives life at the back. 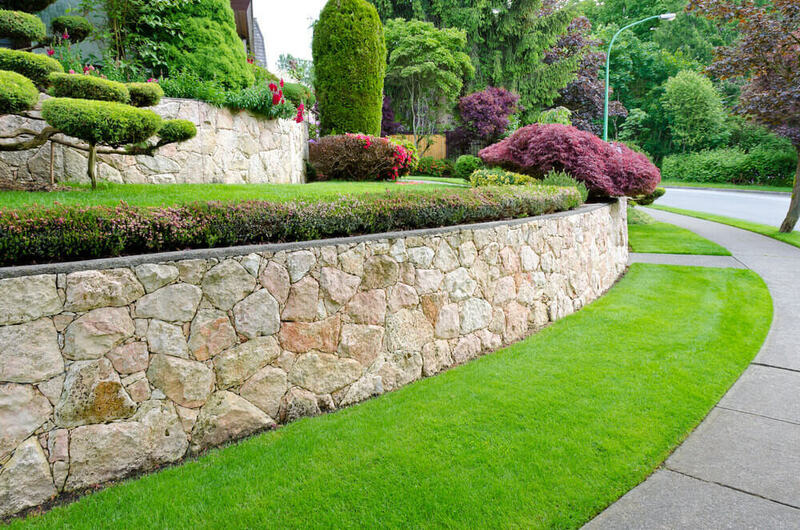 Stacked rubble stones serve as the decorative edging that separate grasses from the ornamental plants. 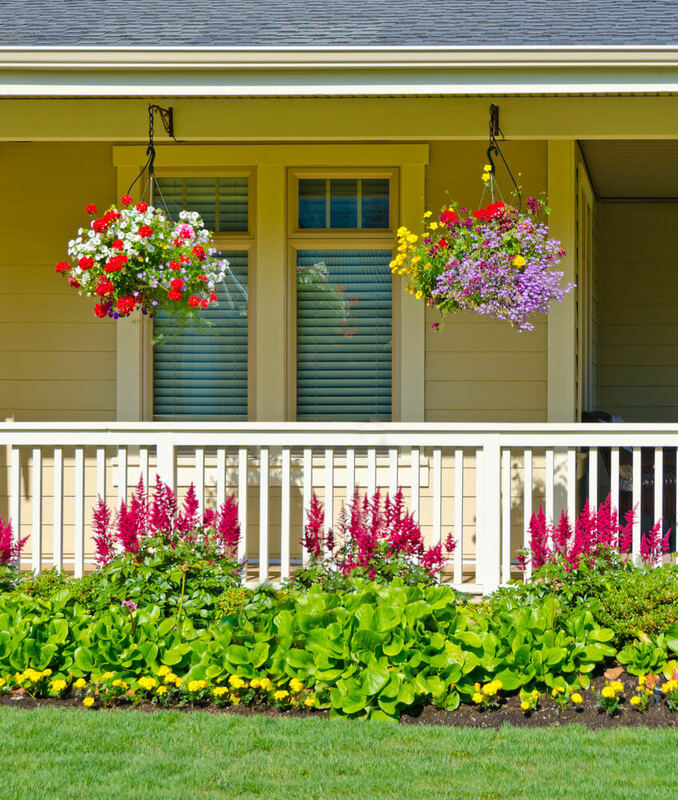 You can find colorful petunias and mopheads blossoming with other greenery. 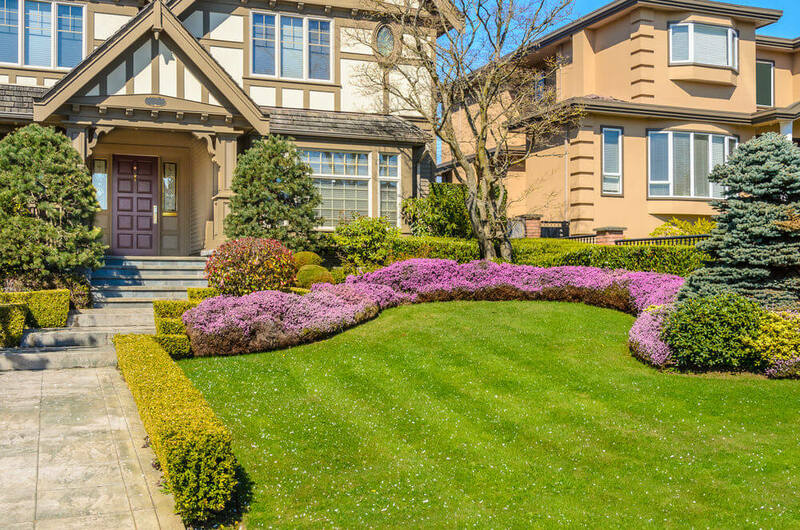 Green Japanese maple shrubs, “anahaw” or palm tree, daffodils, hyacinths, petunias and other greenery fill up the brick stone flower box. Extra creative dish-like topiary capture the attention of the passers by. 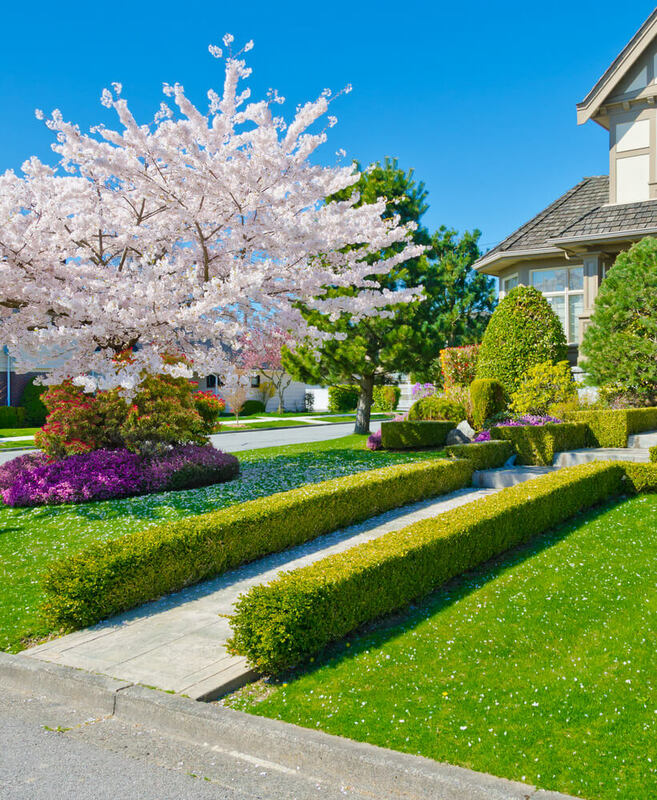 The full-bloomed dogwood tree sprinkles petals on the grassy ground and turns the concrete pathway into a floral aisle that ends at a delicately designed topiary. 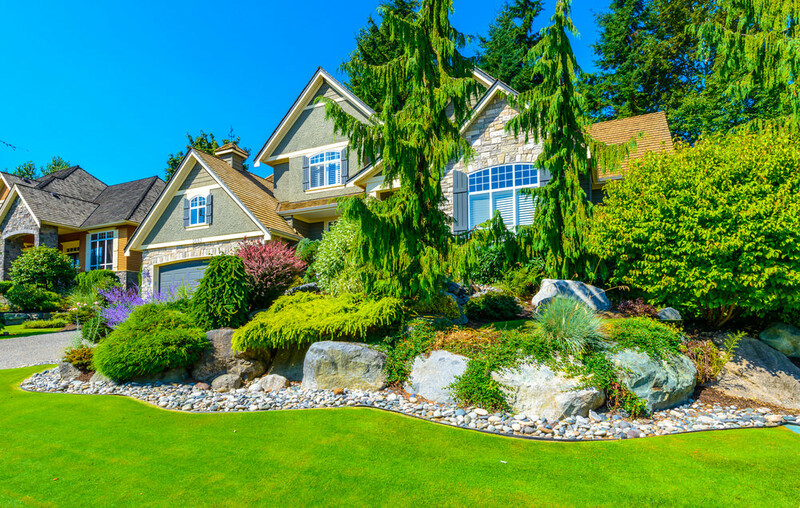 A well-maintained turf grass highlights the calm view of the front yard. 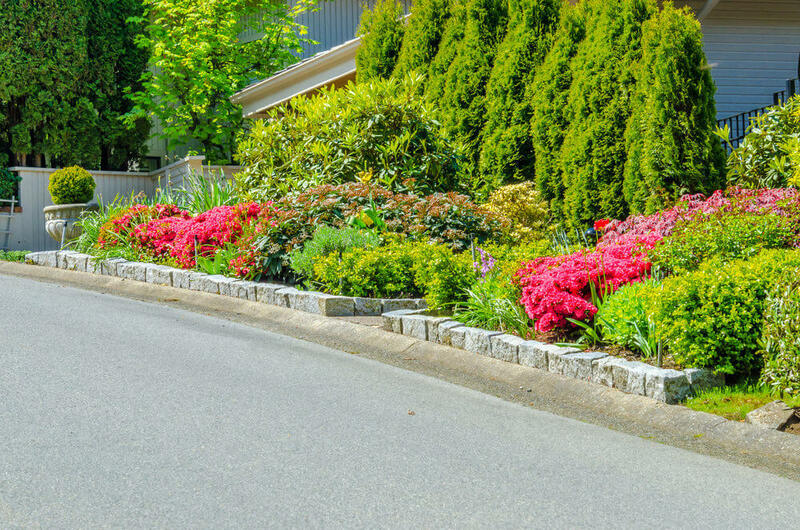 Planted along the edges of the concrete sidewalk are small colorful shrubs. 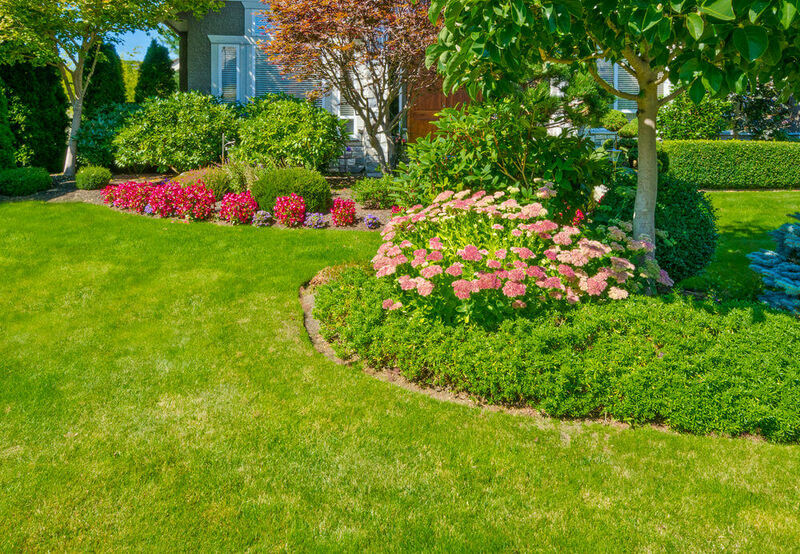 Green Japanese maple shrubs, daffodils, pansies and other green shrubs gives volume to a plain grassy front yard. Resting along the edging is known as the Erica Carnea pink cloud. It highlights the green view with up-sized rocks laying still on the elevation. 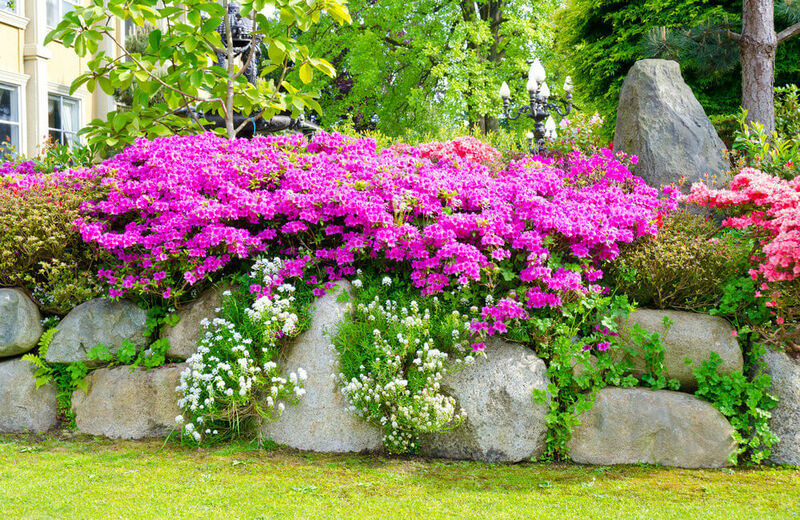 Rubble stones stacked together to form a flower box where ornamental plants grow higher than the grass. 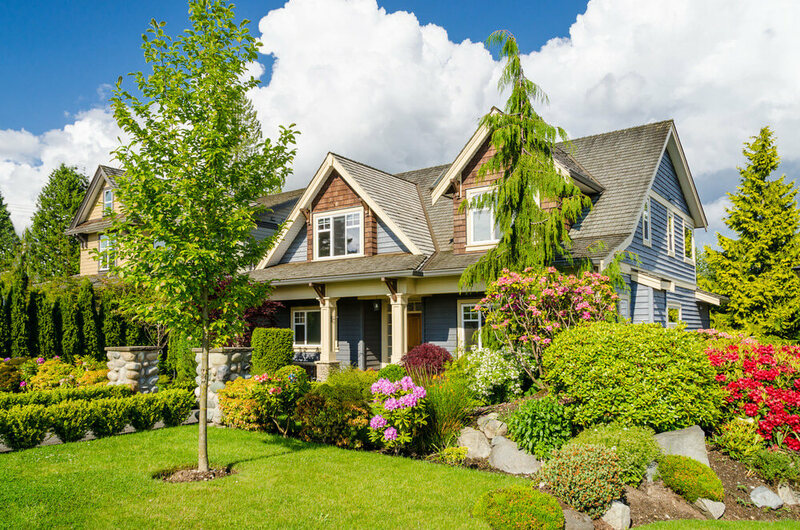 Trees and grasses are the most easy to maintain natural ornaments you can put in your front yard. 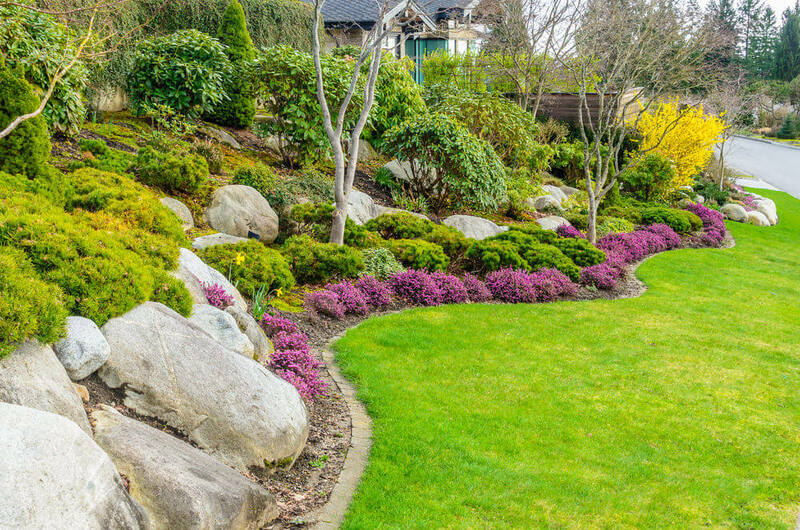 Add a few large rocks and blossoms to give a simple yet creative design. 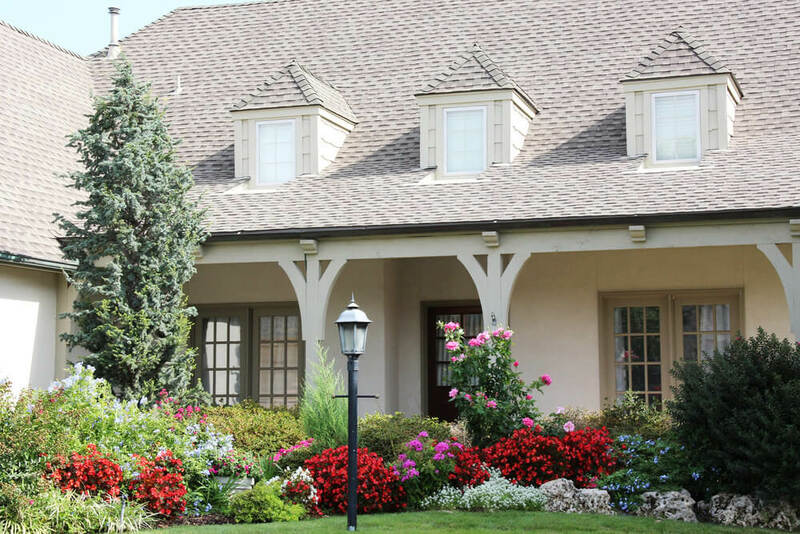 The oval landscape right on the center view of the house is filled with shrubs, pines and blooming red petunias. 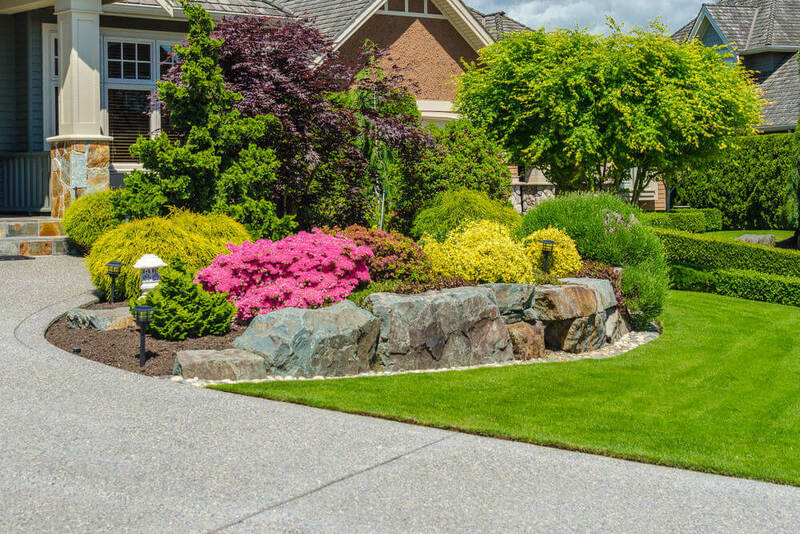 Rocks, grasses and topiary assemble at the center of a concrete pathway. A flowerbed of colorful flowers against a wall with crystal windows reflects the colorful and nature kissed aura. 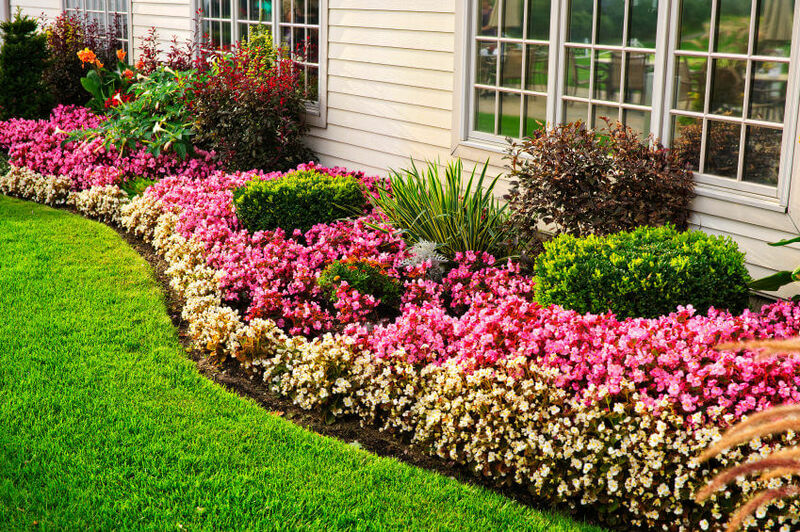 Dazzling petunias and daisies are sparkling on the grassy edges. 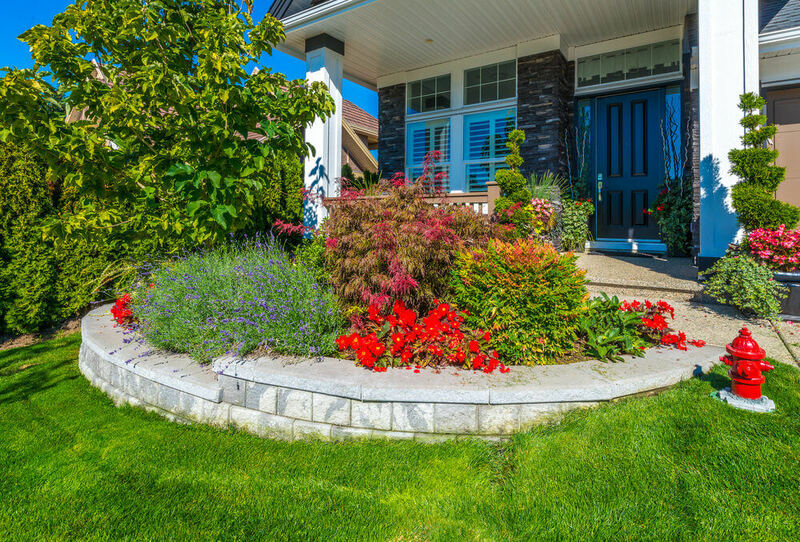 A rubble stone flower box lifts the shrubs on an elevation where mopheads flowers, other blossoms, and greenery stand noticeable. Trees, grasses, shrubs and blossoms almost fill up the front yard. Stones are furnished on the sidewalk’s corner and some on the landscape. 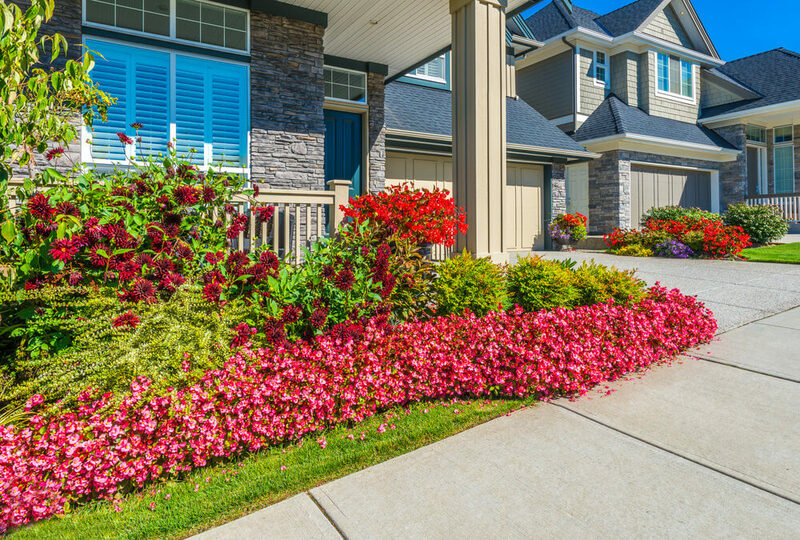 Red petunias and maroon gerbera daisies highlights the view of the bluish brick stone house. Potted shrubs. 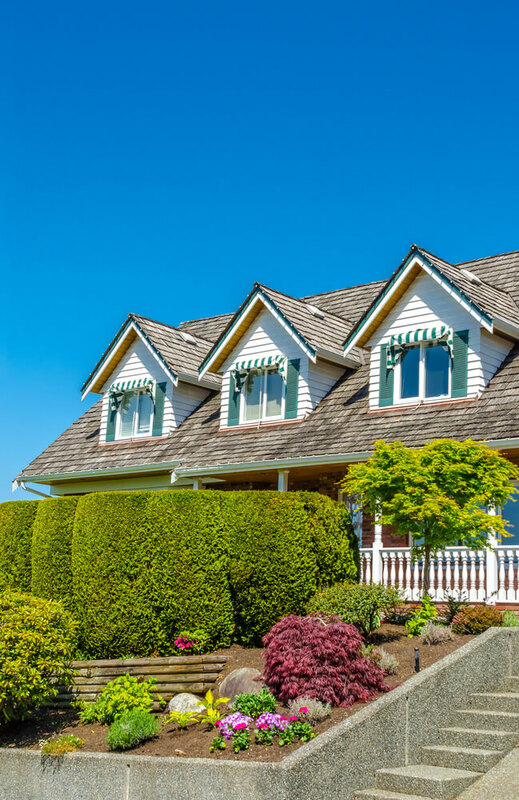 brick stones, petunias, pine trees and other green shrubs beautifully cover the view of the house. 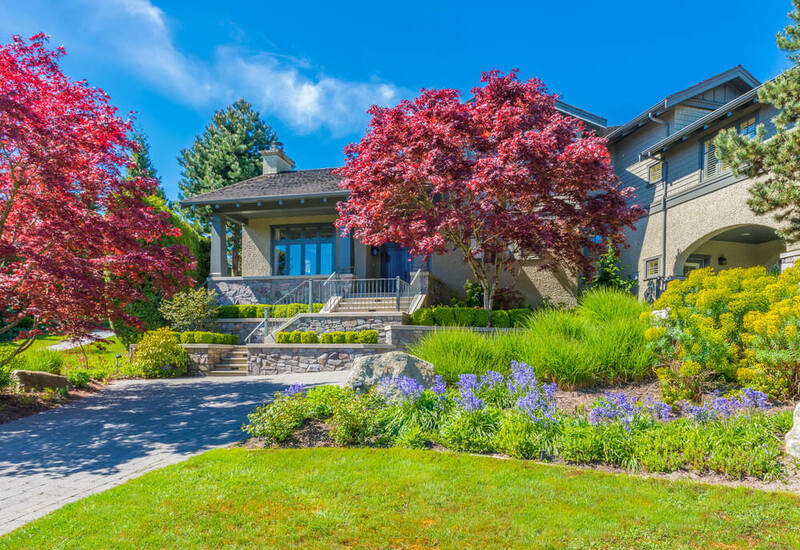 The textured path made of brick stones is constructed with a large rubble stone flower box, landscaped at an elevation where pink cloud blossoms and green shrubs provide full attraction to the house.